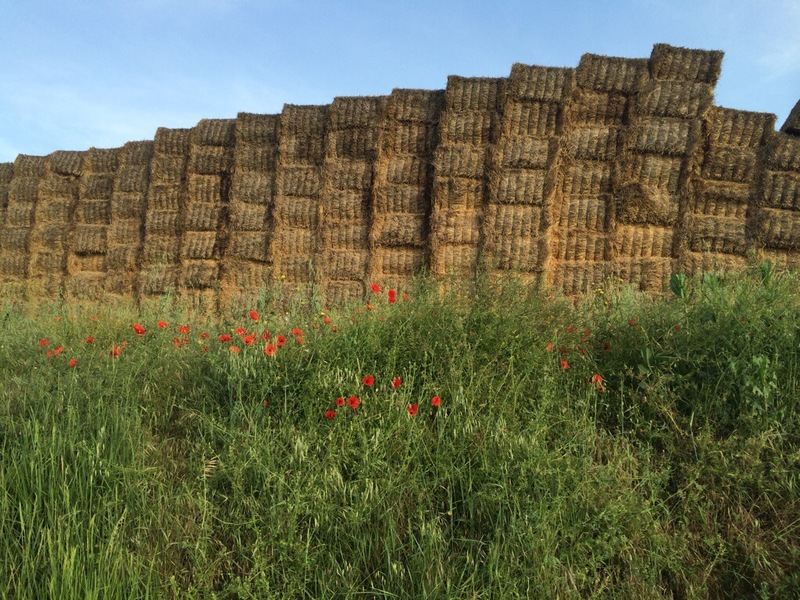 These entries document my June-July 2014 Camino de Santiago pilgrimage in order, for easy reading. You can type the title of the post into the search box to see the original, which allows comments, questions, likes or shares. Have fun. I loved writing these. In the Middle Ages, you started from your own front door, or perhaps from the steps of your local cathedral. Rich or poor, doing penance for sins or seeking your fortune, man, woman or child– you started where you are. 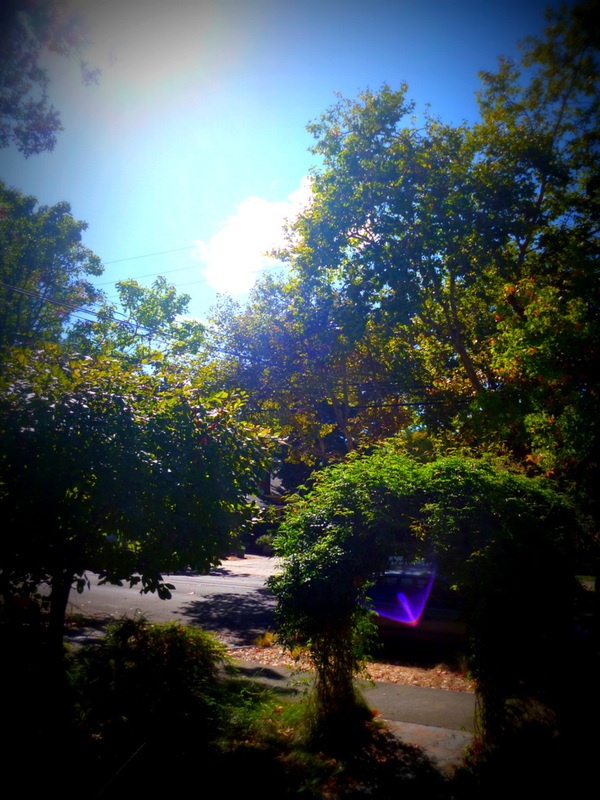 And so here is my own front door on this bright September day in Northern California, the wind whipping the rain clouds and the first reluctant leaves along the pavement. A little glitch of the light entered— a protective travel spirit? It is the first day of fall. 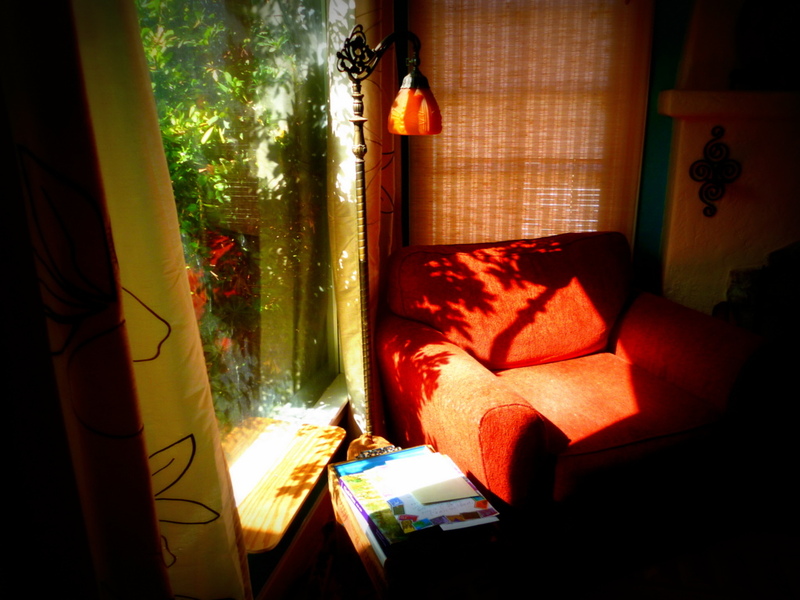 Or this might be the real start, the chair in the living room. 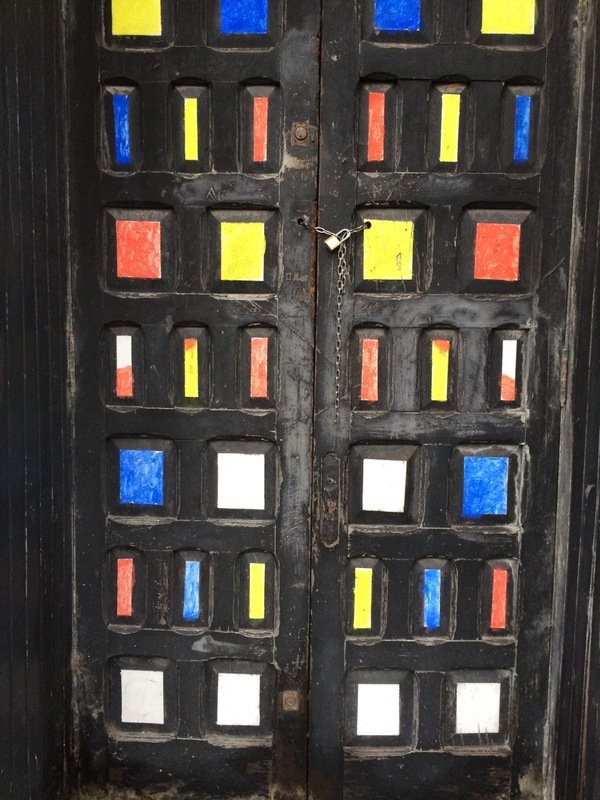 I want to do a private public journal for you, and for me, dear reader and traveler. This is my real and imaginary Camino. 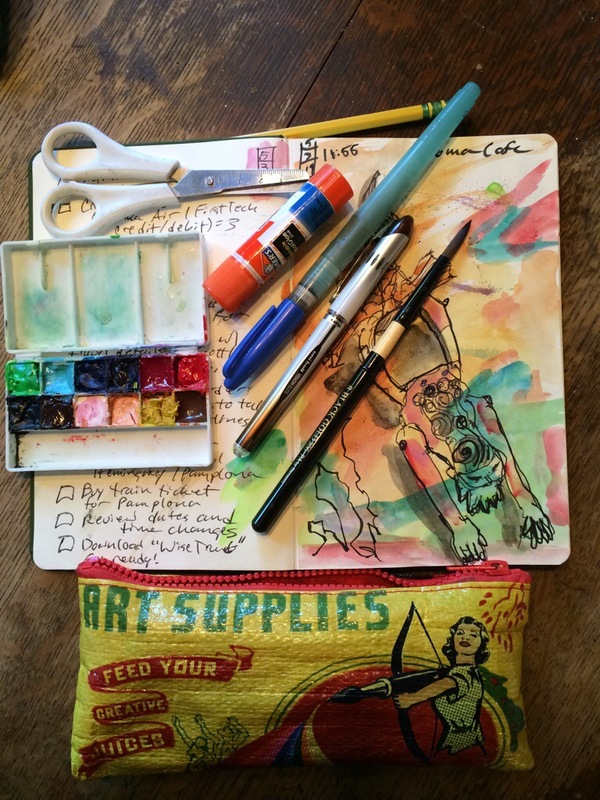 CAMINO ART SUPPLIES: SKETCHBOOK, PAINTS, IPHONE, NO CAMERA! Well, I joined the 21st century this month and got an Iphone. I decided to leave the camera behind for several reasons. 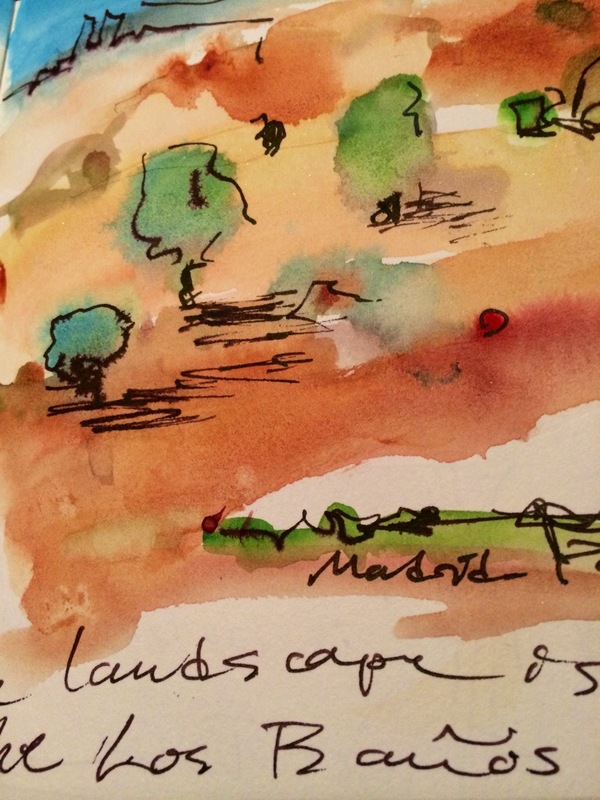 It’s not really a photo-documentary trip, as I want to sketch far more than photograph. I don’t want to be tied to a camera, and a camera is heavy and bulky forbackpacking. I’m now blogging from my Iphone, with photos taken by it. 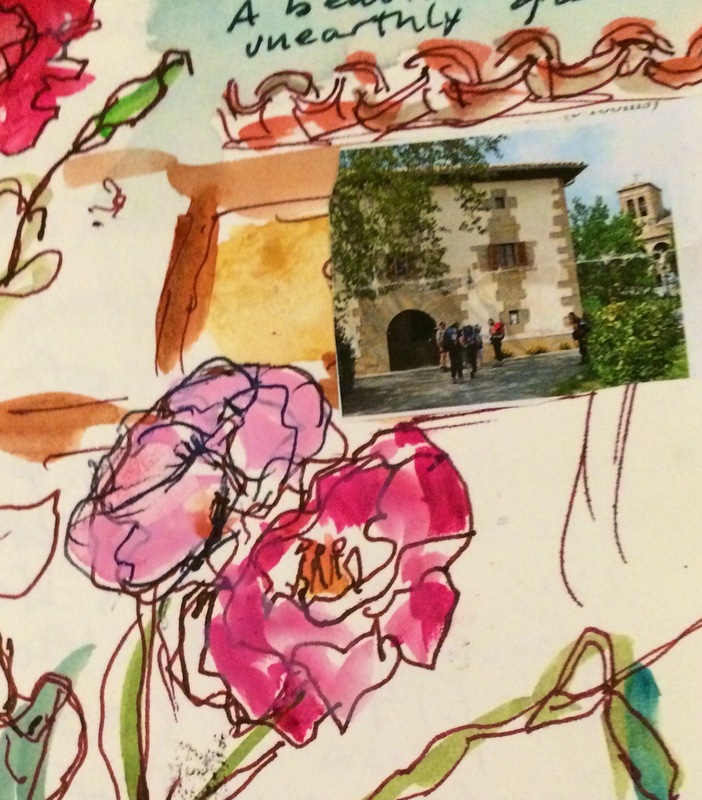 I’m looking forward to doing illustrated travel journaling. I’m carrying a Hand Book journal with around 5 by 8 inches. It has lots of pages of buff paper for a longer journey, and takes watercolor well. 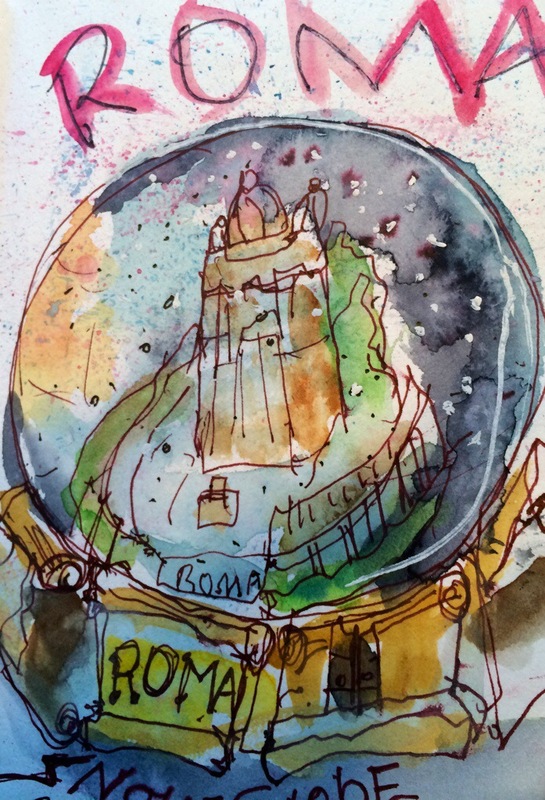 Here’s a sample drawing from Aroma cafe. We all get obsessed with supplies for such a trip. I decided to literally ditch the camera for a journal. I am taking a folding keyboard, as typing a blog on my phone would kill both me and the writing. Goal: fewer photos, more drawings, journals, poetry. We’ll see. 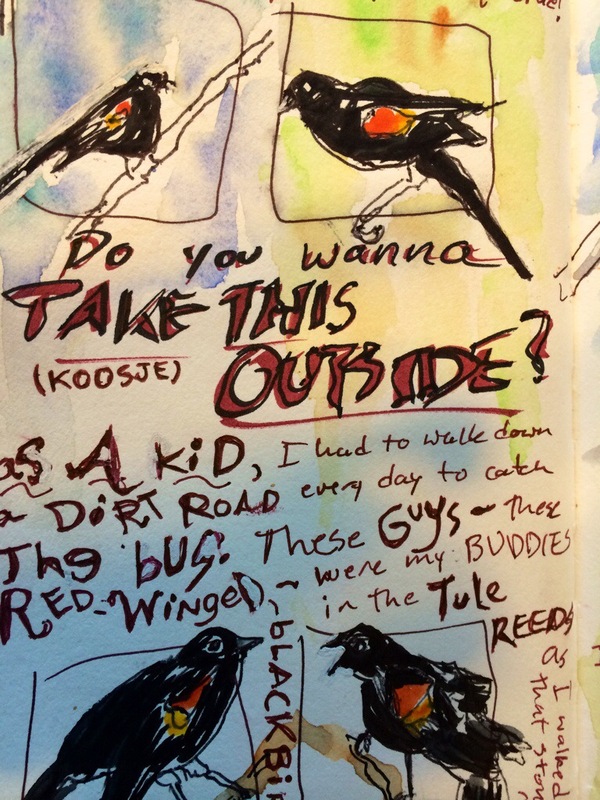 Enjoy some recent illustrated journaling attempts below. I’m leaving tomorrow! But I’ve been packing for months. There are so many excellent packing lists online already for the Camino de Santiago that I won’t add another one. I used several of them for ideas and reference. I was aiming for a 17 pound pack and am in that range. Rather than a list of things I’m taking, I’ll share with you a list of questions I developed for each item. Positive = Plus and Negative = Minus. Each item had to come out strongly on the plus side. Is it multifunctional? Can I use it for more than one thing? example: a tank top and shorts can double as swimsuit, while a sarong can be a towel, a seat, a privacy cover, a skirt and a shawl. Will I really use it daily or almost every day? I ended up not taking a dress or skirt, as I didn’t think I’d wear them enough. I didn’t bring a tent or bivy sack. Will it keep me warm and dry? I have been cold in southern European summers a lot. I’m taking a small sleeping bag rather than a sleep sheet, and plenty of layers of clothing. Anything bought ONLY for trip, that I didn’t own a version of previously. I’m not counting a new shirt or guidebook here, but things like a tea heating coil. I never used one before and I won’t start on this trip. Anyone need one? “Just in case” items. Apart from some things like a few over-the-counter remedies or basic first aid, beware of the just in case. A swimsuit was eliminated, as was an extra pair of pants, and a sleeping pad. Just in case items included anything “extra” or duplicates. Can I buy it easily in Spain if I do need something? This is a yes to most items. Don’t scrimp on certain items. I’m an artist and a lover of European history, art and culture. I bought a good sketchbook with a hard cover and plenty of pages, and TWO guidebooks. I may well get rid of one of the guidebooks, but maybe not. I am traveling by myself and I do enjoy the deeper knowledge offered by a guidebook. I also brought earrings and a tiny amount of makeup. I left a camera behind, though I brought a mini tripod for the iphone for long exposures or videos, and to use to hold the phone as I blogged. Your luxuries should reflect what you love most. My Advice: Bite the bullet and get a little scale that weighs up to 11 pounds. Weigh everything. Here’s something interesting. Get some opinions from others on what you should leave behind. You’ll find that other people are anxious for you to give things up– rather than do it themselves. My hairstylist, a beauty professional, said that I should bring no makeup at all. A painter friend who has tons of art supplies suggested that bringing two differently colored eye liners was too much. Their suggestions had an unintentional irony— but that’s the human condition for you. And the nasty part is that all those criteria of positive and negative I listed above should probably be applied to ALL our everyday possessions! But this is one reason we might need to be pilgrims sometimes. I have a crush on Pamplona. 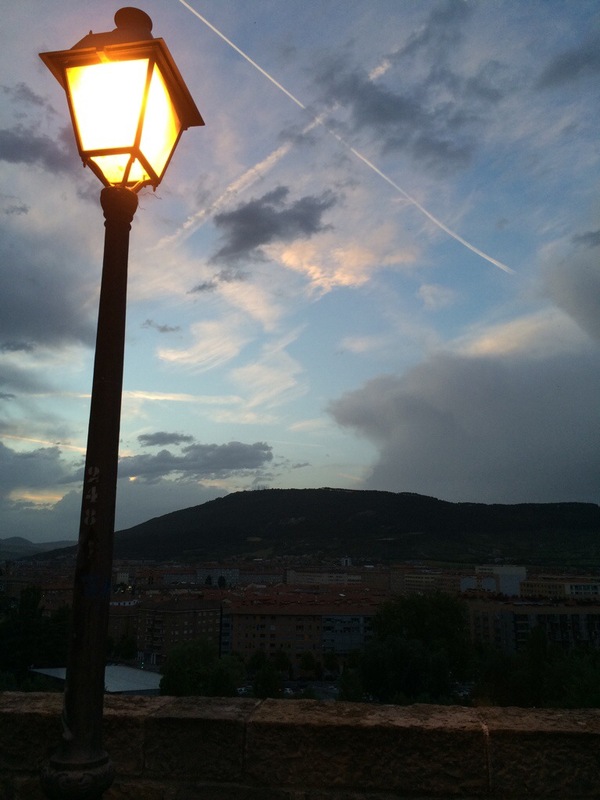 Pamplona is seductive. In fact, the whole journey I’ve had nothing but good luck. People have helped me. Small dark men are courtly and helpful. My hotel is beautiful. I see swallows over tile roofs and hear peacocks calling at night and roosters in the morning. 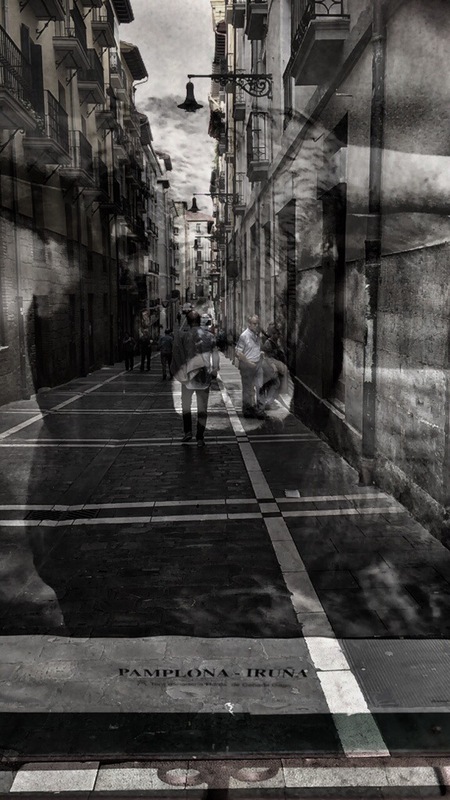 And when I got to Pamplona, the whole city was engaged in a local Black and Red night, with concerts on every corner, and dancing in the street. You can’t describe it: a euphoria and a warm wind, everyone smiling. Best of travel: a room with a view, travel luck stays strong, easy connections. I watch the stream of pilgrims go by and know I’ll be joining them tomorrow. Worst of travel: traveling alone, there’s no one to watch the pack or carry my passport and money. I have to drag the pack into every bathroom. I used to give Scott my passport to carry. No more. I’m in the “training” stage of the journey where I have to constantly check my money belt, securing my phone, etc. Yes, I’m sometimes lonely, but I already feel captured by Spain… happy prisoner. Hola from the extremely slow pilgrim. Today I didn’t walk 12.8 km. I’m between Pamplona and Puente de la Reina. That’s all you need to know. And I’m in a little gem of an albergue, drinking white wine on a red tablecloth in the late afternoon and writing you, dear reader. 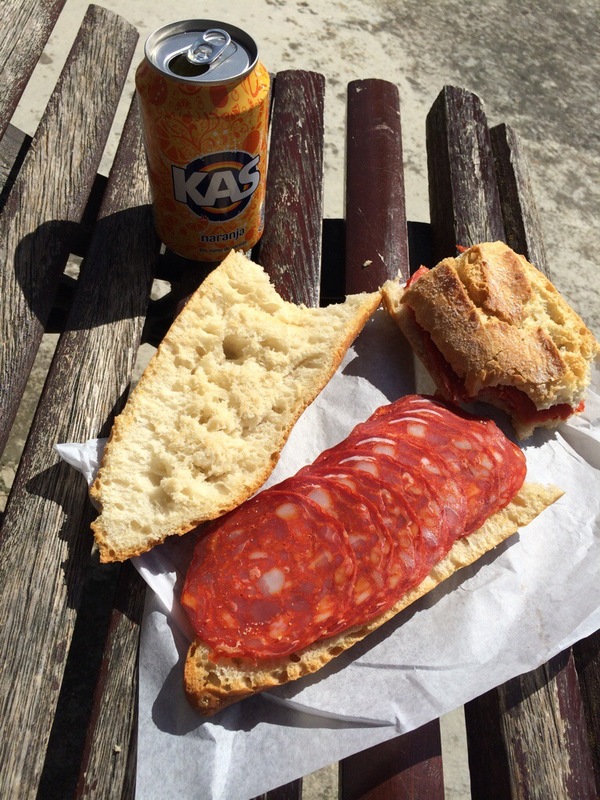 This giant baguette filled with chorizo will last me for 2 more days. The soda and sandwich cost 2.70 E. It could have been beer, no extra charge. I get a full course dinner for wine and desert here, my first meal with other pilgrims. I slept like a baby last night in a room full of elderly Frenchmen; apparently I was in a French “wave”. Today I ran into- not literally, thank goodness– herds of the not-rare-enough species MAMILS– Middle Aged Men in Lycra, normally on bicycles, sending their luggage, include colognes, ahead. Not all of them, of course.. everyone has been sweet and polite, the way life should be. And I am a MAWILC, a middle aged woman in loose clothing. We are the only ones wearing long sleeved shirts and pants. Ah, those limb-exposing, sleek youngsters are lovely. Got up at a respectable 6:30 and the whole albergue was leaving. Everyone leaves at once, but the waves soon vanish, especially if you’re hiking slowly. And I stop, I confess, to photograph and sketch. It”s my Grand Tour, after all; I choose to be Ruskin-esque and enter the world through my pen. 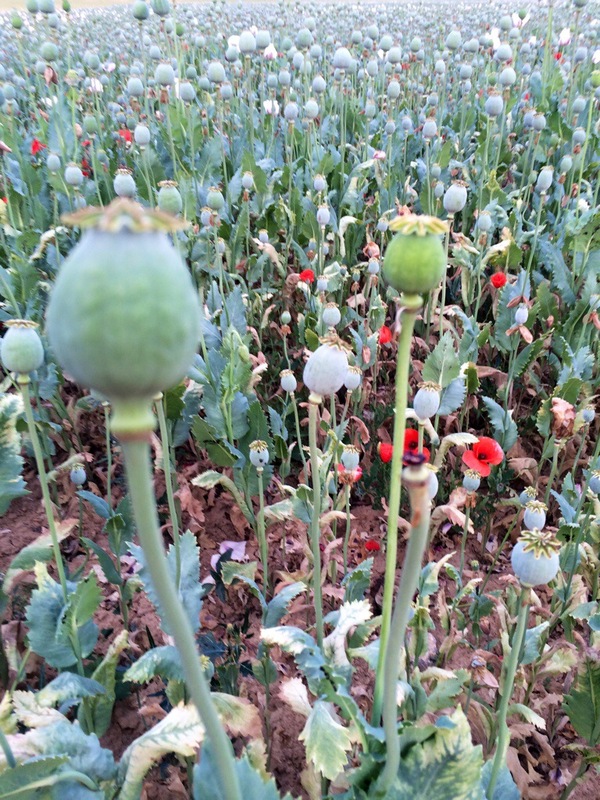 But it takes TIIIIIIIME.Time to see the wheat and smell the poppies. 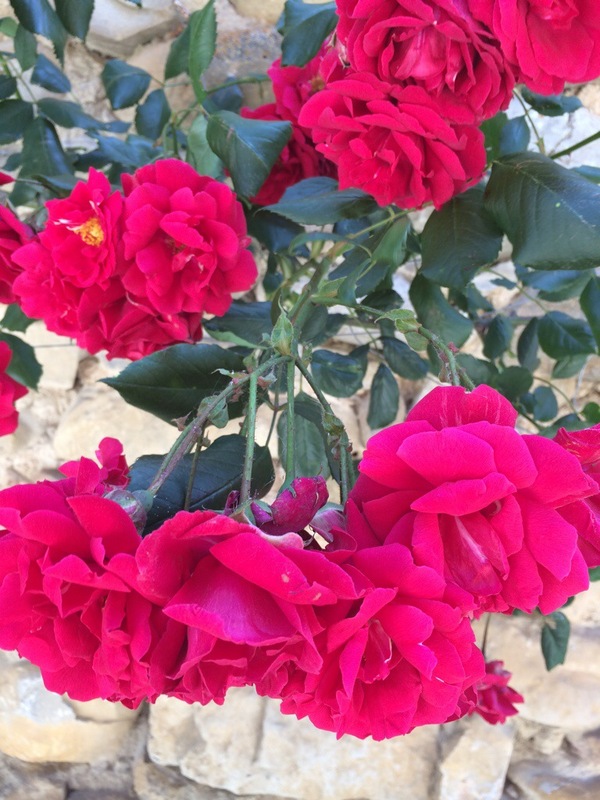 If I stopped to smell every rose in Spain, you’d never see me again. Tip: I tear out pages with maps from the Brierley guidebook and carry them in my pocket. It’s helped me several times when I’ve had to ask directions: nothing like a hard copy. And my small compass mounted right on the chin strap of my backpack is really invaluable. I feel like a child with an address label sewn in. Do they even do that anymore? 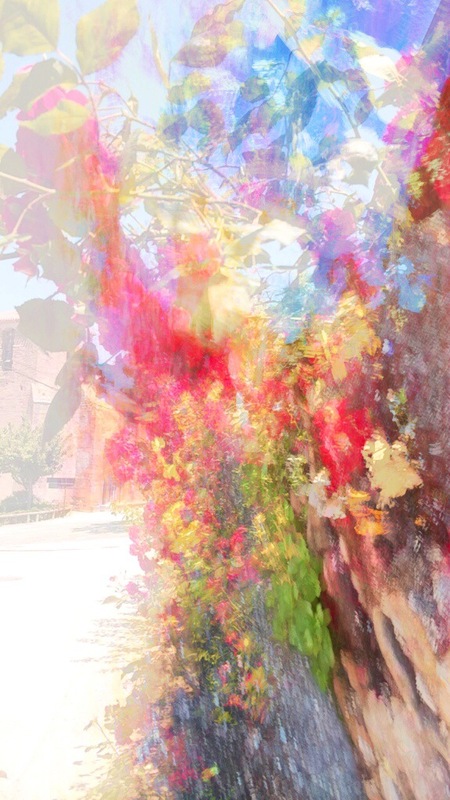 Since you read this far, I enclose the abstract photo of roses blowing in the wind. Ultreia! HOTEL: THRILL OF VICTORY OR AGONY OF DA FEET? Just words, I think, for now, no images. Whew! I just escaped teeming Dorm Land, no place for me or my phone to recharge. Am in a delightful small nowhere bar, sitting on a chair near an electrical outlet. I have no table– there are outlets near tables but none of them work. They were cheerful, though, and directed me proudly to the random outlets that did work. My “table” is a bar stool. I am nursing some kind of tart rose. Thank you, Bar La Oca, for the smiles. I find Spain enormously welcoming. The 90 person dorm room tonight will pose a challenge to my mild claustrophobia. It’s now a dangerous maze of packs in the tiny walkways. Paranoid, adult thought: hope there’s not a fire. The hip young have ruthlessly taken over all the communal tables for complex, delicious dinners…. I never cooked like that in a hostel. The albergue is donativo, free. 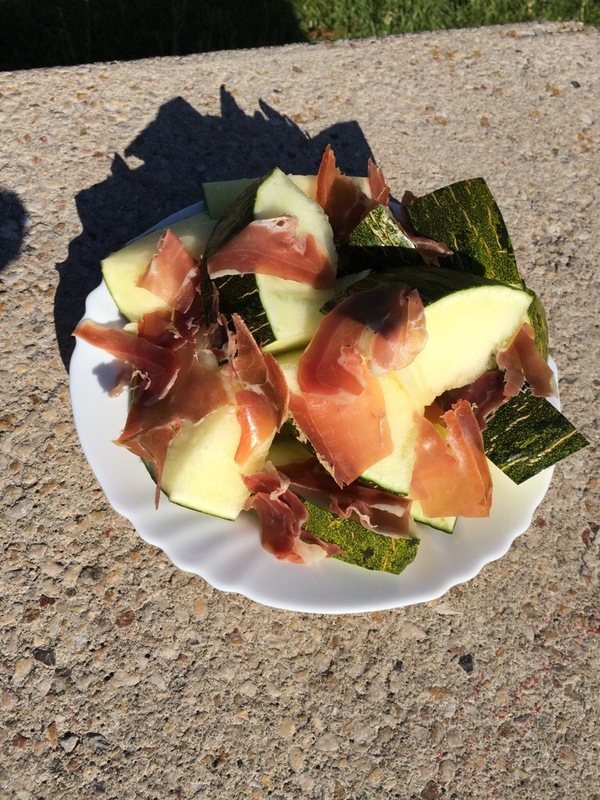 My own dinner was a melon with some Serrano ham strewn over it and eaten in front of the shallow river. I guess I managed to download some photos after all. All are at the end of the post. I know that before I walked I wanted to know some details. Just to say, I did walk 17 km today, about 11 miles, going very slowly for my feet. 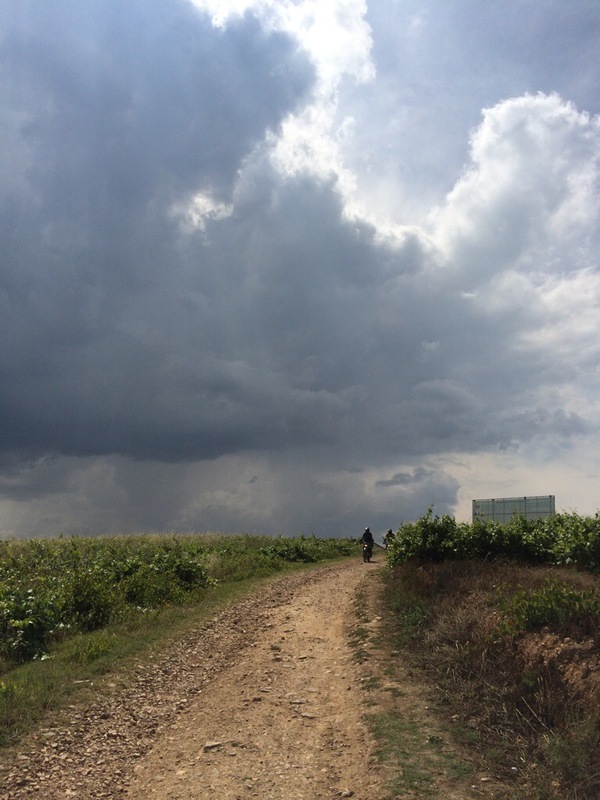 It was mostly through vineyards and the paths were either gravel or paved. Weather has been perfect the whole trip, in the 50s at night and warming during the day, not dissimilar to Santa Rosa. Here are some practical details for you. Showers are complex because you have to stay decent before you step in, and carry all your valuables, as well as your toiletries and the clothes you change into, with you. So you are jamming and balancing. Everything of any value comes into the shower with you. The tile floors are uniformly slippery. Then you get in and press a knob like the controlled flow knobs in sinks in public restrooms, and 10 seconds of either freezing, lukewarm, or scalding water comes out, then cuts off. Repeat. Repeat. Repeat! American’s packs are too big. The Europeans are cruising along with packs about the size of a daypack. I have lightened mine up some… never mind what. But I have pack envy. There are no silk sleep sheets. Everyone has an ultralight bag about the size of a football or a bottle of water. They have a tiny lining, very similar to my Marmot Nano 55, which has worked great for me. Girls, my most prized outfit is a loose tank and a running skort with shorts under it. I use it for after hiking, swimming, and to sleep. The all purpose wardrobe! Dress it up with a scarf! My day: wake up at 5 AM. Take my roll of clothing and toiletries out of the dorm, to a restroom or kitchen, to dress. Drag pack out. Drag sleeping bag off bed and stuff in other room. Rearrange pack, sometimes for a half hour or more. Wash. Wish for coffee, but drink a liter of water if I can choke it down. Other people are up, tripping over each other. Tend to feet for the day with whatever combo of fixups you have: tape, moleskin, compeed, bandaids, antibiotic cream, anti friction cream, what have you. Put on shoes. This isn’t easy, as you aren’t allowed to keep your shoes with you, but must put them on a shelf in another room. Same thing for poles. When you get your shoes on, marvel how good they feel without a pack on. Then lurch out and start your day. Stop for a coffee at the first bar and sneak eat your yoghurt, then walk on. Sun’s getting warmer now… stop on trail, pee, put on hat and sunglasses. And walk. Today I met some beautiful people, and it was just like the films where you have soulful talks while walking through lush vineyards. Oliver, French, was great: we discussed mind-body issues and how the brain can’t interpret where pain originates. He’s in the straw hat. Then Billy, an American college student I’d seen twice, struck up a series of questions about The Artist’s Way by Julia Cameron and Joseph Campbell’s mythology. “Have you heard of Joseph Campbell?” he asked politely. He made a beautiful metaphor…. he said that he thinks the Camino is, for him, a coming out of the labyrinth of the Minotaur, following the golden thread. And the golden thread is just one step in front of the other, and you don’t know where you’re going, but he trusts it. I probably won’t ever see them again, but that statement lacks the high drama it might have in other contexts. You just never know. You spent some good time, and that’s enough. I talked to some women, as well, but none of them would allow me to take her photo because we all, er, don’t exactly look our best. I, for example, resemble a plump nun while walking, completely covered head to foot with long loose pants, long loose shirt, and one of those dorko cover-everything hats with a wimple, I mean flap, in back. In purple. It seemed like a good idea at the time. I just wanted to say, I have never felt in danger this whole trip. I have felt cared for and protected the entire time. This took place last Sunday and Monday, after realizing I had really wrecked my feet– and my aplomb– with the fabled 21k day. 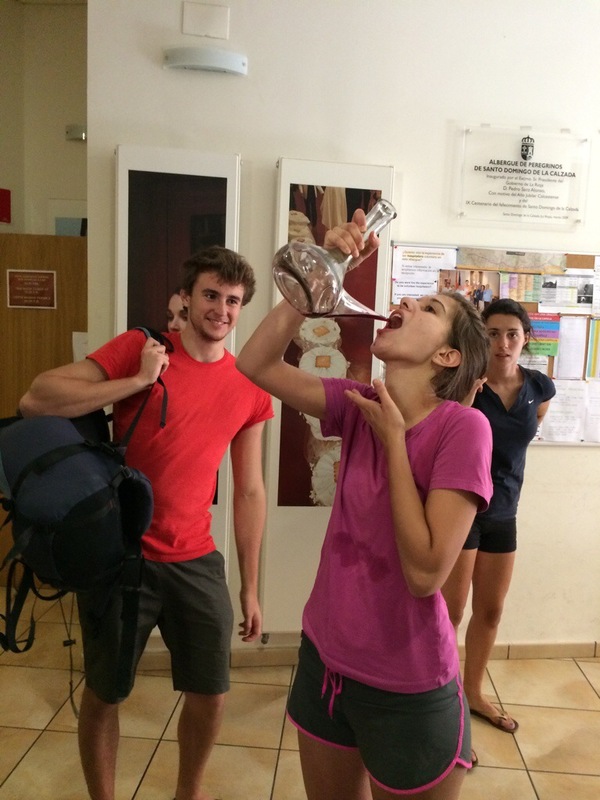 I took a taxi to Logrono today for another rest day and checked into another pilgrim dorm. My mood was low. There are several kinds of dorms, municipal– run, perhaps for hundreds of years, by the city, parochial, run by the church, and private dorms which have sprung up everywhere. 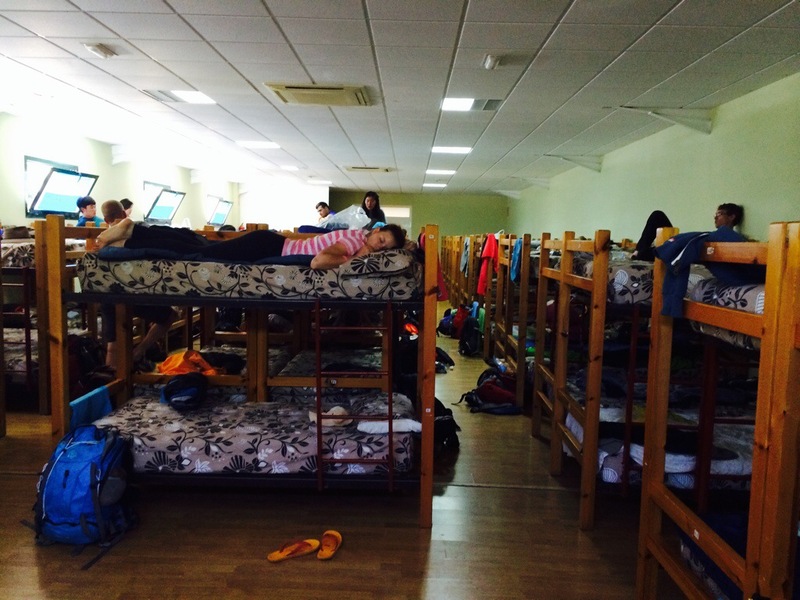 I chose a private dorm, and it wasn’t a good choice. I’m finding out that often the better bet for true hospitality can come in institutional packages, from people who’ve been housing pilgrims for a couple centuries or so. The dorm I chose was a private one, which can be great, but can also be oriented more to the tidal wave of pilgrim dough than the pilgrim. They can be sloppy about hygiene. I unloaded my stuff, had a shower with soap I bought from the Euro version of a dollar store. The shower was not pleasant, with a dirty floor and warmish water. Then I went for a walk. When I returned,the room had that body smell, which unfortunately was a stinky redux of the night before. I’m finding out that a disturbing night has a real impact. The night before, it was the awful body odor, like unwashed clothes of the homeless, emanating from the towel and pack of a man across from me. The Italian guy in the bunk directly over was grossed out too. Luckily my bed was by a window. 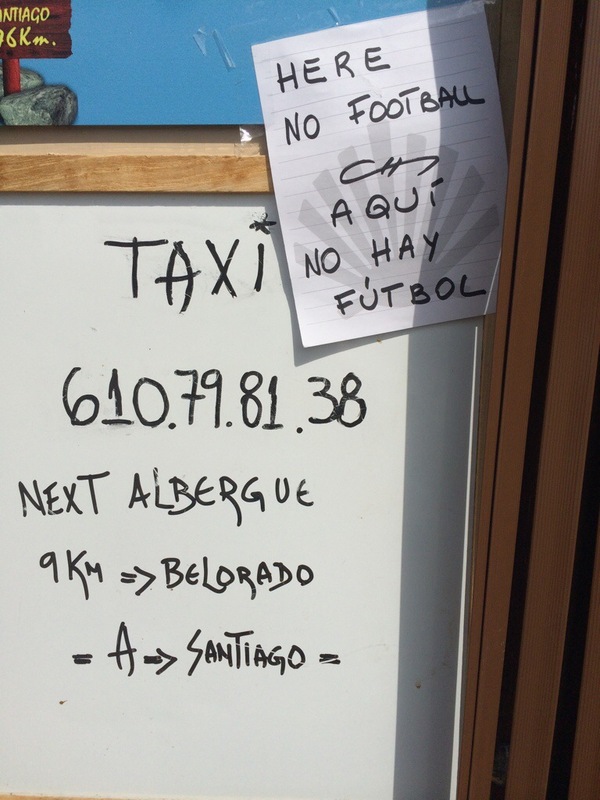 We asked the manager of the albergue to talk to the guy about moving his pack outside, but he never did. The Italian guy’s girlfriend offered me some Vicks to rub under my nose, the same thing the coroner uses for examining corpses. I should have taken it. I don’t know how much I want to write about a bad mood or event. They happen in travel and in life. But my feeling of oppression increased in the Logrono dorm I had chosen . By chance, I was the only woman in the room and it felt, not dangerous, but just too much. I was filled with regret about not just waiting around for a few hours for the normal church dorms to open. My impatience tripped me up, just like it did with the 21 km day. Hmmmmmm…. could there possibly be a lesson there? My mood darkened, dangerously so. When you travel alone, you have only yourself to rely on, and a bad mood poses a real handicap. My feet were really hurting– I could feel an infection starting in the sole of my foot, the same sole that would have to step into public showers. So when I saw a hotel, I just walked up and checked in, then walked back to the albergue and picked my stuff up. Scott had to talk me down. I stayed off my feet in a sterile business hotel, with deep bathtub. It took two days for my feet to heal up. I felt guilty, impatient, grateful, sad, stuck in sterility when life just teemed outside. And it was a hundred percent my own bad decision. I am so lucky I have the bucks to take a hotel when I want or need to. But it still feels like a tiny bit of defeat. Strange, I meet many people who feel defeated if they can’t do 30 to 40 km, 20-plus miles, a day! We all have our points of pride. I think that 30 Km is a very long day even for the twenty somethings. People are really getting injured going that far. In my own mind, which is still full of judgement, I call them “The New Penitents,” punishing themselves through painful walking. I’m sure they think of me as a dilettante. By the way, all the “recommended” divisions of the Camino are 20 to 30 km. I have so enjoyed going more slowly. When I get my Pilgrim Passport stamped, I also have them put their stamp somewhere on a blank page of my travel sketchbook. This starts a painted travel collage-sketch of that place. I do one or more most days, another reason why I enjoy shorter hiking days. 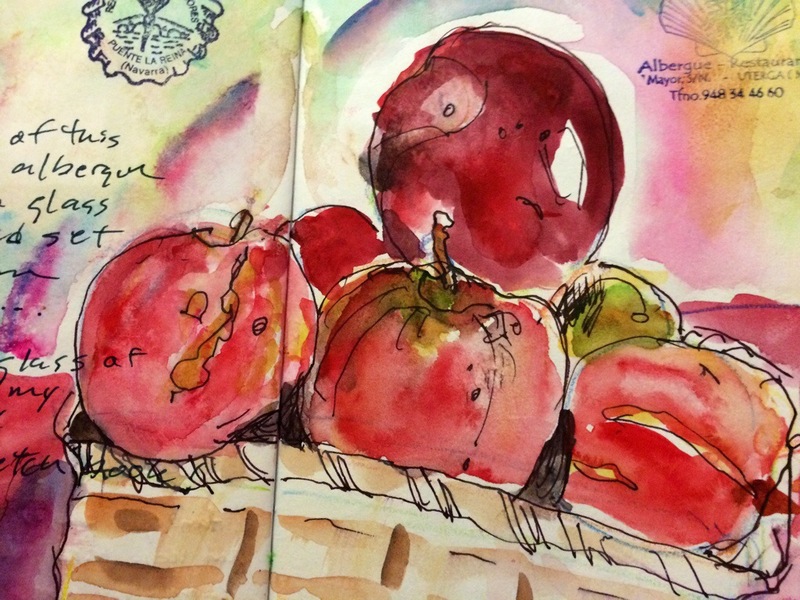 This painted sketch of apples in a basket got me a jar of garden flowers and a free glass of wine from a Basque grandma. 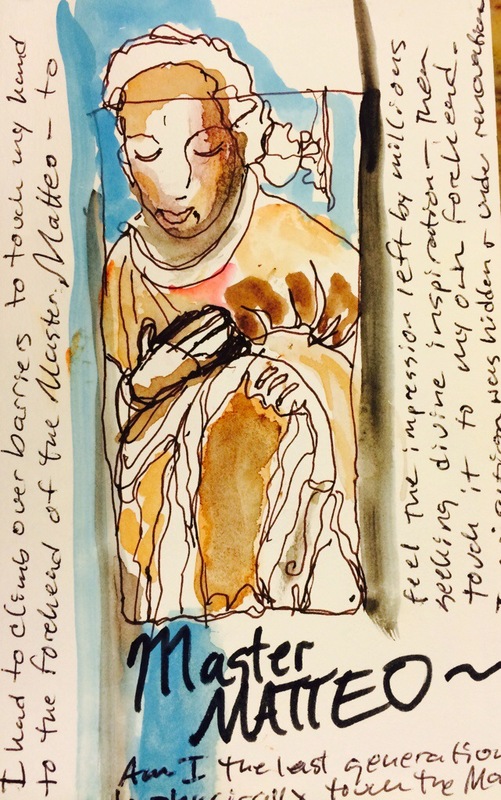 I am not above making sure that when I bring out my notebook at check in time– my Pilgrim Passport is stored in it– that the person sees the paintings. I’ve gotten some special treatment from it, I think: a slightly better bed and so on. They are really just for me, a sensory-rich artifact of that fleeting time. 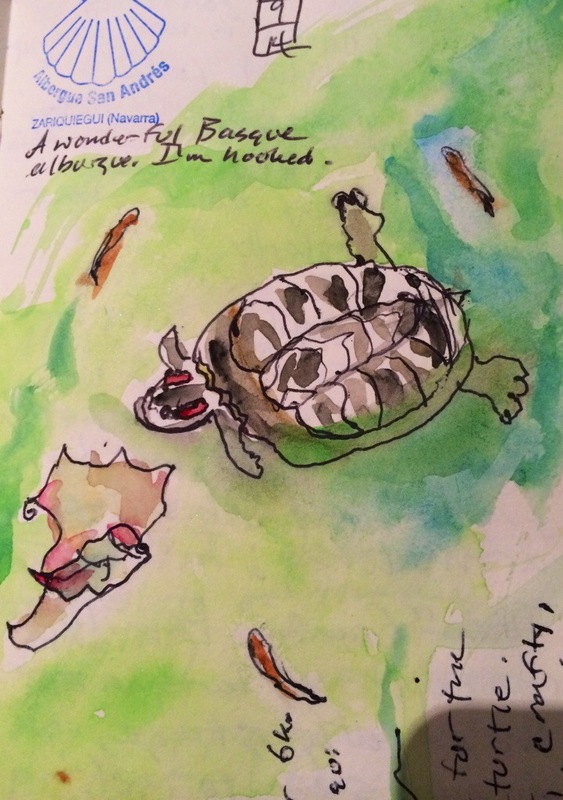 Turtles in an ancient pond in the middle of a walled garden, orchids on the counter of the Kind Albergue Keeper Jose, a gargoyle from an octagonal Templar chapel— all were drawn from life. My little travel kit is always close at hand. 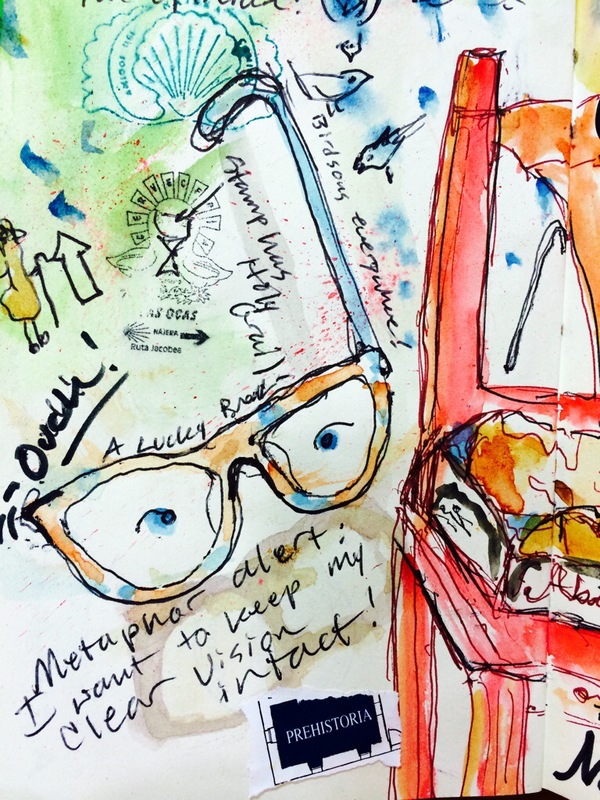 People want to watch me sketching and photograph me; I’m an oddball pilgrim. These are no masterpieces, but they are expressive and unify me with the place for a brief moment. I am reading The Art of Travel by Alain de Botton on my Kindle app. It’s marvelous. He provides brief meditations on famous travelers, then links them to a travel experience of his own. I live on Humboldt Street, named after the amazing traveler and scientist, Alexander von Humboldt. De Botton tells a story of Humboldt’s travels, then concludes with this remark. Instead of bringing back 16,000 new plant species, we might return from our journey with a collection of small, unfeted but life-enhancing thoughts. Anti-bull killing for sport. I agree. It must be a horrible way for an animal to die. I love these abstract pilgrims! I’m the one on the right. The virgins are growing very strange, dense, and encrusted, very asiatic. I am in deep water here. Though adept with Christian symbols, I often have NO IDEA what’s going on. The churches are magnificent, creepy Twilight Zones, where it seems the saint figures might well come alive and walk around. Often they fill an elegant Romanesque shell with gold Baroque madness floor to ceiling, as if an insane pastry chef had frosted a plain loaf with dozens of giant glittery sugar roses. The day started badly but ended well. Every night I take off my glasses and put them in a stuff sack in the bottom of my sleeping bag along with phone, passport and money. When I took them off this morning, an earpiece had broken off. In a foreign country, this can seem to be a really big problem, but I closed my eyes and thought “What would Scott do?” He’s the guy who can fix anything. Here’s what I might do, before I became a wise Peregrino: panic, don’t change schedule, stick glasses with duct tape, have lousy, sticky and disfunctional glasses for the rest of the trip. Here’s what Scott would do: while away several hours until an optician opened and have them fixed. So I had a coffee, potato and egg tortilla, and an Aquarius (fizzy Gatorade type drink, supposedly with electrolytes). For two hours. And painted a few notebook pages. 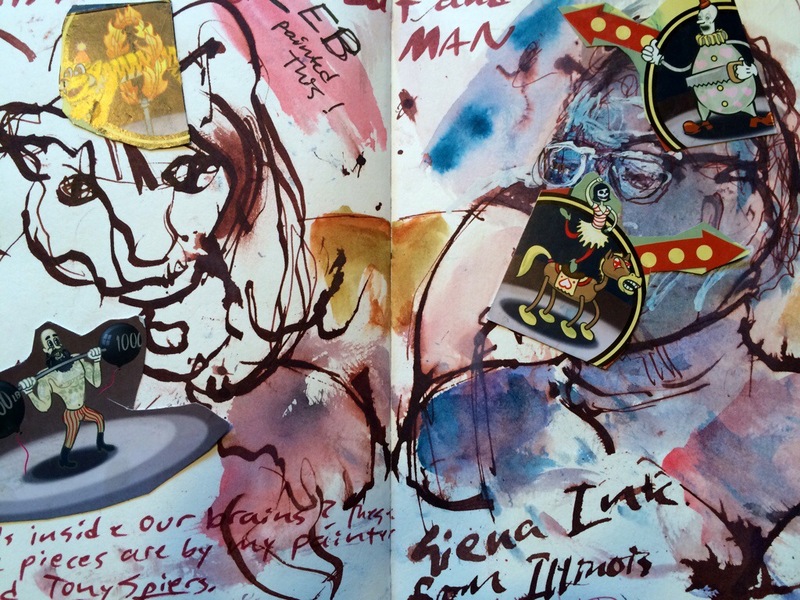 The nice thing about the illustrated journal is that it always gives you something to do. And I got them fixed. 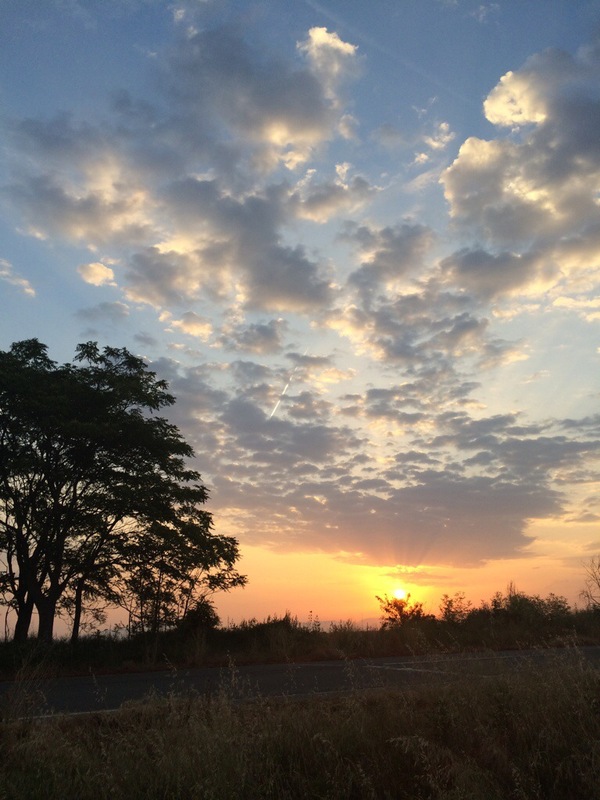 By that time it was late in the morning, so I decided to take the bus to Santa Domingo. And I’m so glad I did. It turned into a completely relaxed, pleasant day. I had one of those extended lunches at a cafe facing the cathedral. I went to the small prayer meeting offered by the brothers who ran the albergue. I did laundry and visited the backyard chicken coop that supplies the cathedral chickens, who are not even on ground level but in a ridiculously backlight sort of alter a story high so you can’t even interact with them. 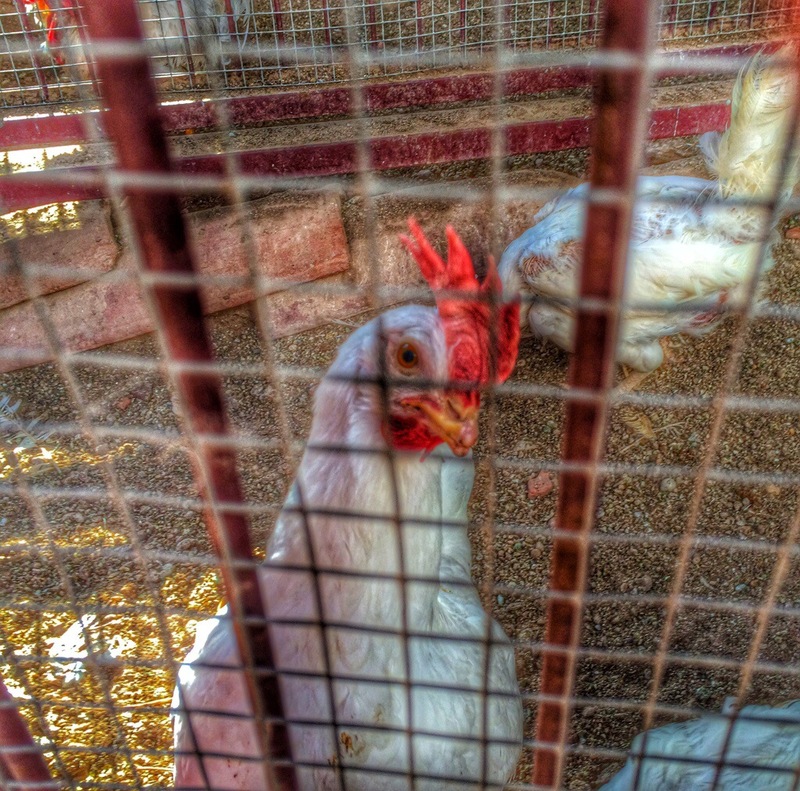 Now that was disappointing, but I went back to talk to the patio chickens. The albergue is lovely. 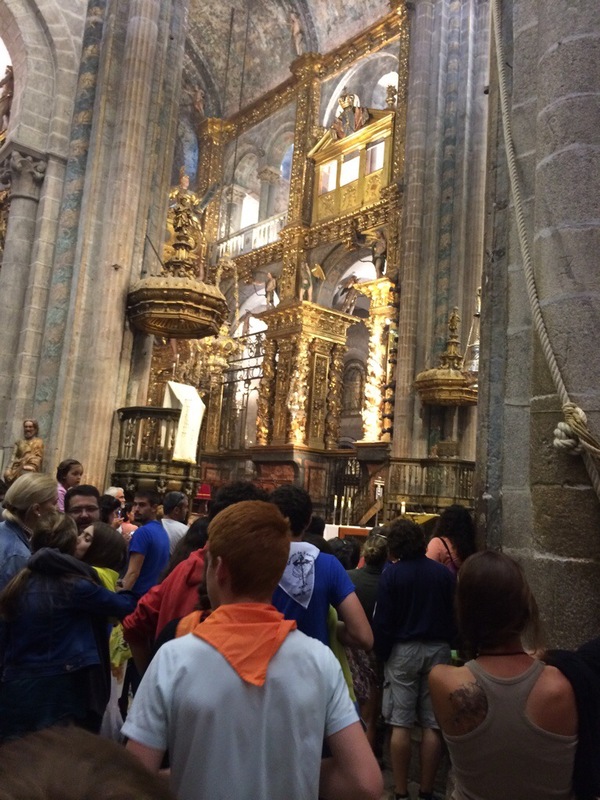 The cathedral is grand and I think I saw Santa Domingo’s skull, but I’m not sure. He was a supercool saint. He came from a poor, lower class family and so the church nixed his becoming a priest. He said, fine, and proceeded to build a pilgrim bridge, a hospital, and improve the roads and highways… and founded a town and a cathedral. The church’s loss was the pilgrim’s gain. Domingo was a do-er and fixer, as is Scott, and like Scott, he can often be found with a few chickens at his feet. It was a day where a possible mishap was transformed into a fine, unexpected travel day. The thunder rolled down the valley like waves crashing on the beach, with lightning flashing an irregular strobe. We didn’t care, tucked away into the smallest (10 people), most magical albergue, an ancient village building where all the rooms slope and exposed beams are not a designer fashion. The village has only 50 souls and no stores. The Pan (bread) truck, a white van I’ve seen everywhere in Spain, skids into the plaza and begins earsplitting honking. For many minutes. Bread is a matter of urgency. This albergue is the home of Acacio and Orietta. They are good friends with the author Paolo Coelho and there’s a book in which you can leave a message for him. Their business is run entirely on donation. Both of the couple have walked he camino many time. Their house is full of books, warmth, easy chairs, and superb hospitality. 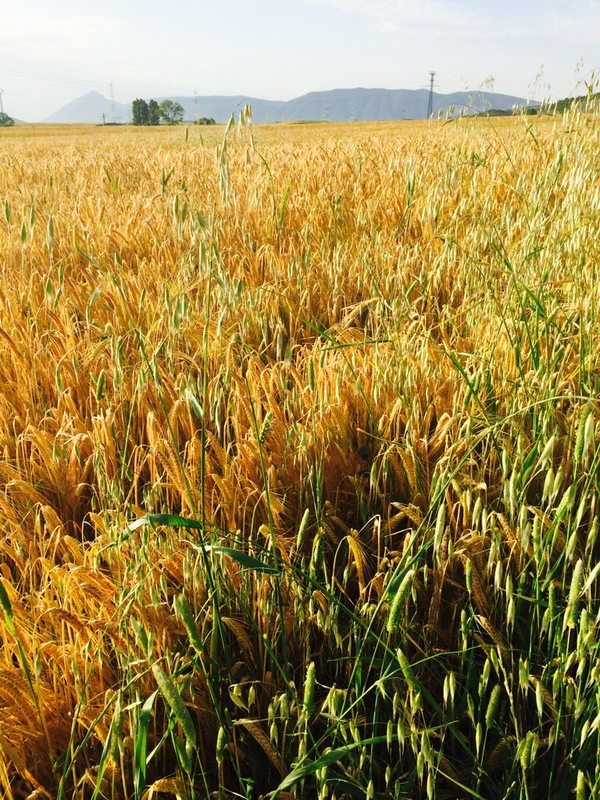 Cameras can’t catch the implacable golden sweep of the wheatfields, and a photo can’t convey the warmth of that dinner. “Soupa magica” is Acacio’s term for pilgrim soup, a combination of soup and the Portugese sopa. 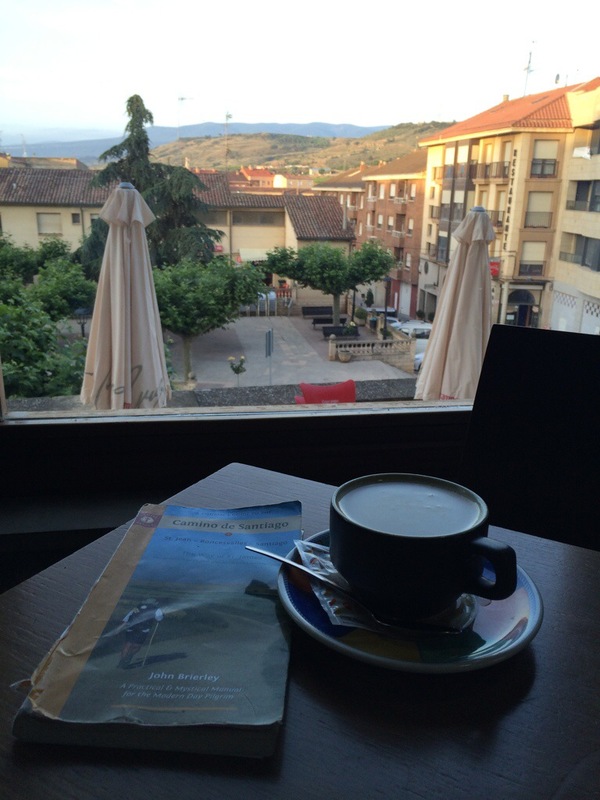 It’s difficult to write about the Camino. A lot of your inner experience is private. The writing tends either to become Shirley Maclaine-ish or degenerate into a kilometer-sore foot-lodging blog. 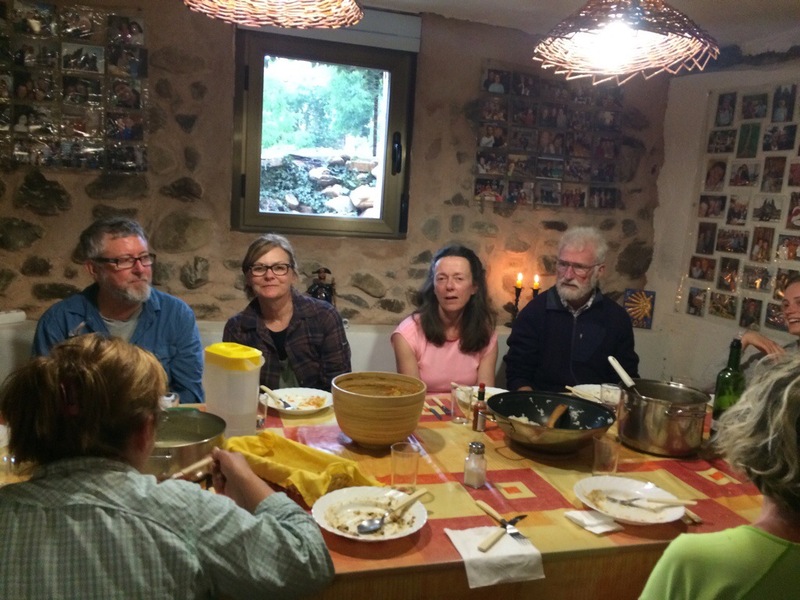 Orietta told me that a way a pilgrim can give something back for all the kindness extended is by the sharing of experience: being hospitable and open in your heart to sharing what you know. Thank you, Acacio and Orietta. Acacio is an passionate advocate for the inner necessity of the Camino. He also has much hidden knowledge about the history and soul of the Camino, but you’ll have to ask him yourself, over a bowl of Soupa Magica. This is Carlotta, my sort-of friend for three hours climbing into the ancient hilltop village of O’Cebreiro. The landscape looks like this. To Carlotta it all looks like food. 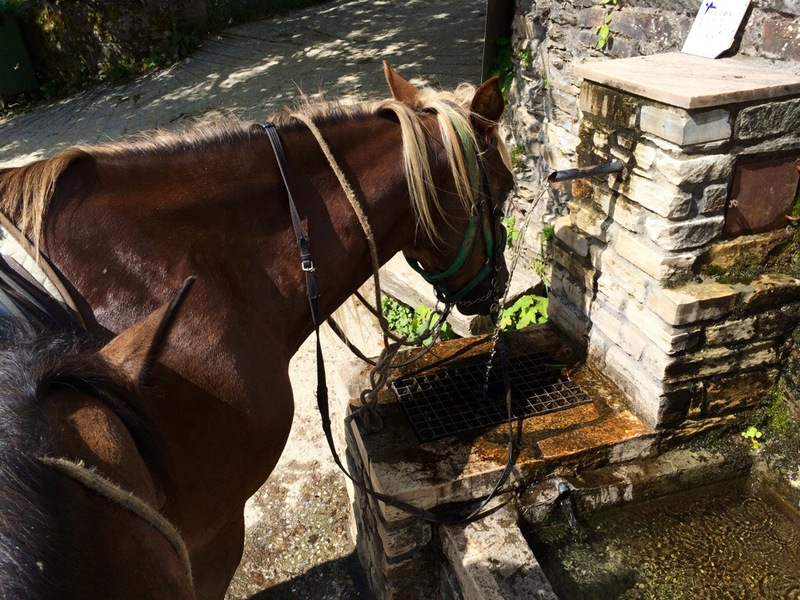 That’s Bonnie trying to drink water from a flowing pilgrim spigot, although there were plentiful horse troughs. I found myself going up a mountain on a horse by accident. 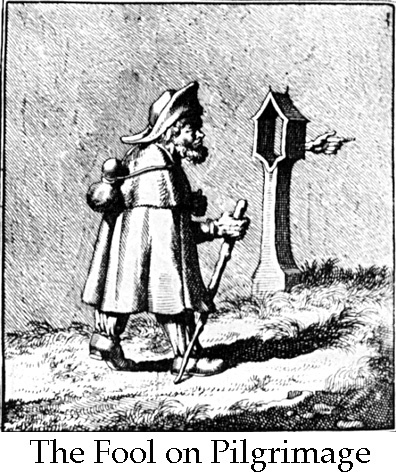 I had walked a few miles out of town and someone called out to me, “Are you on the Pilgrim’s Forum?” It’s an online information site about the pilgrimage. We started talking at a bus stop. Julia is from Britain and Nadine is Australian. Turns out they had this plan to take horses up. I asked if they minded if I joined in… the rest is history. Horse’s shoes on stony paths really do sound like the coconut shells of Monty Python and the Holy Grail. And they have a 10th C. chalice in the church. Close enough. I bought Victor and his daughter Carlotta a beer afterwards. 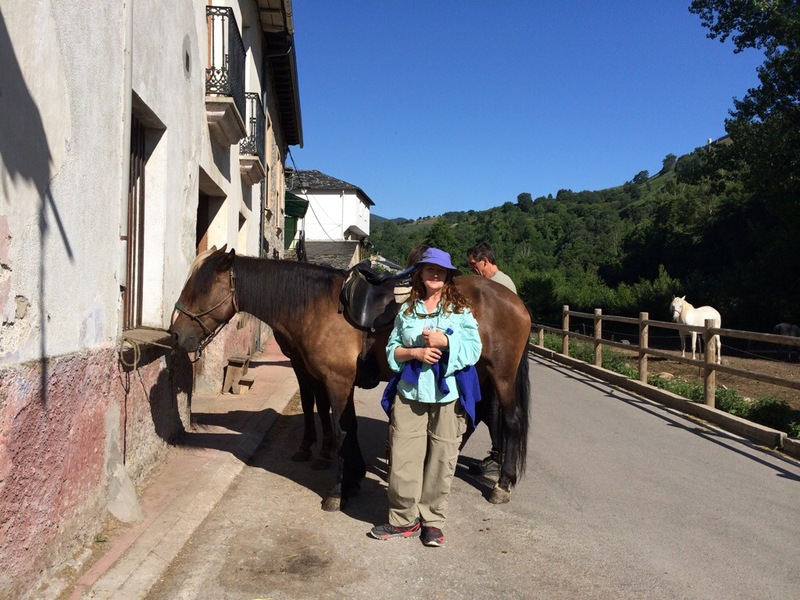 He would like to develop a sort of Pony Express for the Camino, with horses, half day rides and food and lodging. I loved this ride so much. 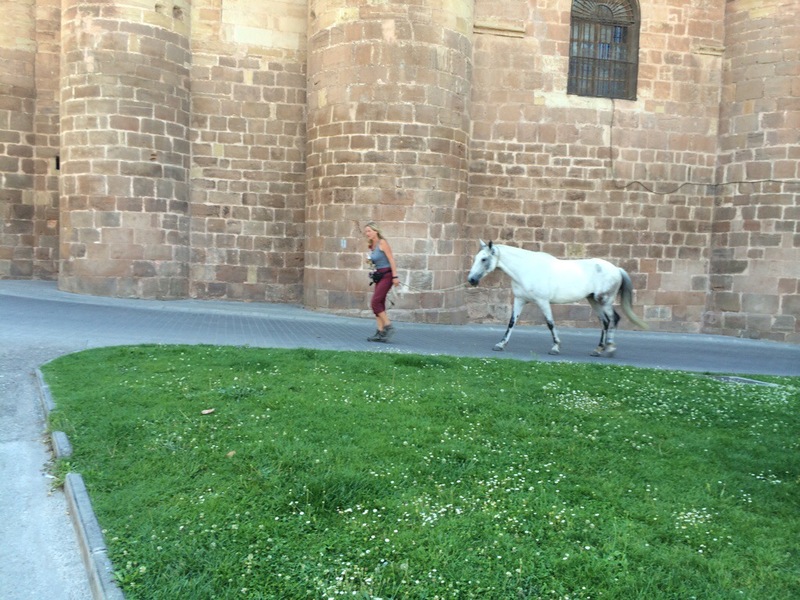 Victor told us that you can ride horses directly into one entrance of the Cathedral of Santiago. Can you imagine the steps of the horses echoing in Gothic arches? I would love to do this. Dawn now, and veils of mist drift through. I have decided to stay one more day. This place has a sort of poignant, piercing beauty I have felt in only a few places: Big Sur, the Lofoten Islands in Norway, Karpathos in Greece, Hampi in India. I’ll catch up with my writing and sketching. I keep losing photographs and writing because there’s no wifi here. I’m doing everything on a wavery data signal from my phone. Time to stop. No pictures today. The heart of Celtiberia here in Galicia rejects internet waves, just as the Templar church would cut off any phone reception. I can’t put in pictures so I will have to, as Ruskin put it, word-paint. I have been reading Ruskin and Yeats, the kind of books you can get from Gutenberg. org, the source of thousands of copyright-free books. I loaded a lot of classics I had never gotten around to before I left. I did have a few KIndle books I bought, but I knew the classics were lurking. It’s sort of like eating all the junk food in the house first and then being left with actual nutrition. Today I walked for four hours in a windy, chilly downpour in the middle of June. Heading down the mountain I climbed with the steed Carlotta, I felt like I was paying for the angelic ascension by a sort of hellish descent. It must have been in the forties, with horizontal rain and pretty good winds. Once again, I seemed to be walking alone for hours. I felt like the giant black slugs I saw on the pavement… moving soooo slowly. I just had a quick coffee before I started, so at a certain point in the morning I found myself with a hot chocolate, bread and cheese from yesterday, one hardboiled egg, a soaked travel salt, and a small glass of cognac to warm up… brunch. I got back on the road and the rain got worse. I slowly soaked up water, wicking it up from extremities as my shoes filled with water. And yet… it’s all so beautiful. Spurs of a brilliant fuschia foxglove flower are everywhere, and hidden waterfalls are running. Because this is not a plain old backpacking trip, I am working on a good outlook as I walk. It’s not to Pollyanna up an uncomfortable situation– walking alone on a strange mountain in a big storm– but to try to notice the beauty around in the middle of my discomfort. The first room I tried to stay in didn’t work out, and I’m glad it didn’t. I’ve landed in a solid country paradise, with a huge wood stove pumping out heat, home made Galician soup, chickens pecking among the tables, and heaters in the albergue room that are actually pumping out heat. This reminds me of the Wanderhutte my former in-laws, Hans and Paula, used to run. That place was always full of farmers and travellers, like this one. The so-called town has about 50 people so it’s the only game in town. It’s a throwback, the kind of country place that hardly exists any more in California: real, hospitable, cheap, a grandma in front of the fire, and local guys from town at the bar. They’re discussing things in Galician, yet another Spanish language. Ruskin would say, if you can’t actually draw, paint a picture with words. Shoes and boots are drying in front of the cast iron stove. I watched someone take off their shoes and their socks literally steamed! An orange rocker is reserved for the grandma. A Swiss youth who looks like the hope of the blond nations is chatting with a dismayed middle aged German couple. The chickens were let out of the bottom of the farmhouse as soon as the rain stopped , and are pecking and crowing among the plastic outdoor cafe furniture. The plain molded plastic chairs sensibly have holes in the seats to let rain run out. Now why don’t we do that? The hostess yells at me, not because she’s angry, but because if you yell, the foreigners understand better. Three huge, dispirited German shepherds are lying sadly in the courtyard, too tired to interact with guests, A black and white kitten is in the woodpile. 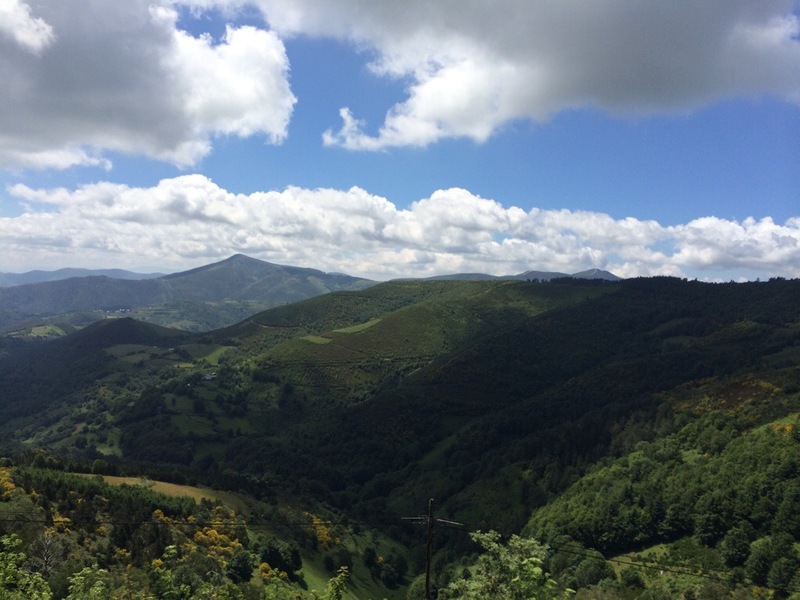 And behind it all, the beautiful hills of Galicia loom, spotlit with gathering thunderheads filtering the late afternoon sun. I could never have found such a perfect place to stay if I had spent days on the internet and in guide books. I am working on abandoning myself to the travel spirit, intuition, and guidance. I have good friends in the books I’m reading. The poignancy of this journey is that it can hold so many emotions, and so much beauty and fatigue, in a single day, or even a single moment. Last night I saw one of the historical contenders for Holy Grail, a golden chalice with a golden sun like disk in it . It was lovely, and the setting was amazing… the original 9th century church, arguably the oldest church still in original form on the Camino. I watched people kneel before it and pray, while outside, drunk tourists were posing and singing. What use can this ancient myth have for us? In the churchyard, the cemetery, the graves are raised slate boxes, one for each family. I have also seen tombs that look exactly like vertical bank or gun safes, including a lock and stainless steel handle. While the revelers sang, an old grandma went into the churchyard and spoke quietly to someone who lived in the slate box of her family. Her ancestors may well have lived in the same place for over a thousand years. This beautiful girl, Jenny, came all the way up the Le Puy route, over 60 days into her journey with her French master. They stayed at the country place because there was a stall for her and a couch for him. I told you it was the right kind of inn. This hound would lay directly in front of the albergue entrance so you had to step over him to get in. Later I saw the three huge German shepherds roaming through the fog like spirits of wolves. I’m walking in fog and chill wind, but thankfully no rain. I am sitting in the first place in the mountains of Galicia that has weefee , so I can post a few pictures. The fire, as a primal element, deserves its own photo.The owner would heap huge logs covered with moss and lichen into it, and urged us to dry our shoes in front of it. Here’s a travel tip: stuff old pages ripped out of your guidebook into your shoes to help dry them. 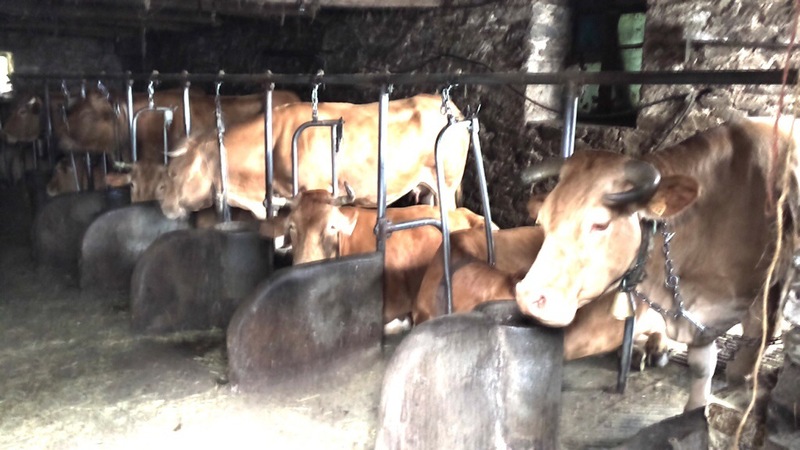 Beautiful brown cows make a beautiful fresh cheese with the consistency of soft tofu. A heap is served on a plate with a little compressed square of quince jam to eat it with. Delicious! 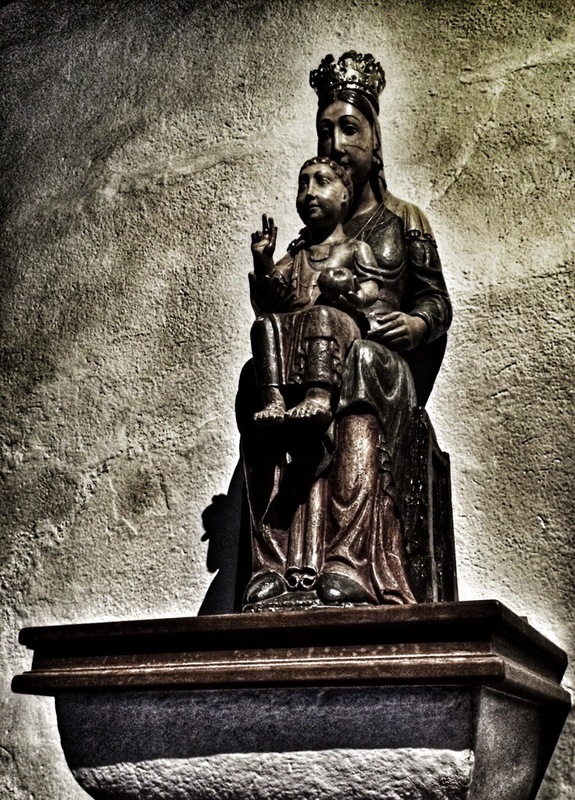 This is a beautiful 12th century virgin. She is the patroness of O Cebreiro, and her feast day is celebrated on my birthday. Since it is the custom to dress up many of the more doll-like virgins in costumes, I felt free to dress her up digitally, and a halo appeared. 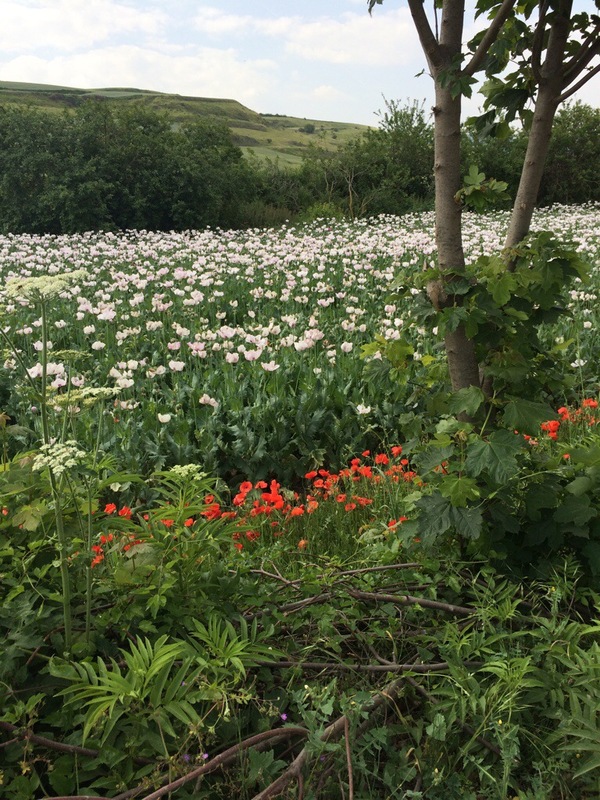 The landscape is just honeycombed with virgins, each dripping a blessing into a little village. The thunderstorm that soaked me. 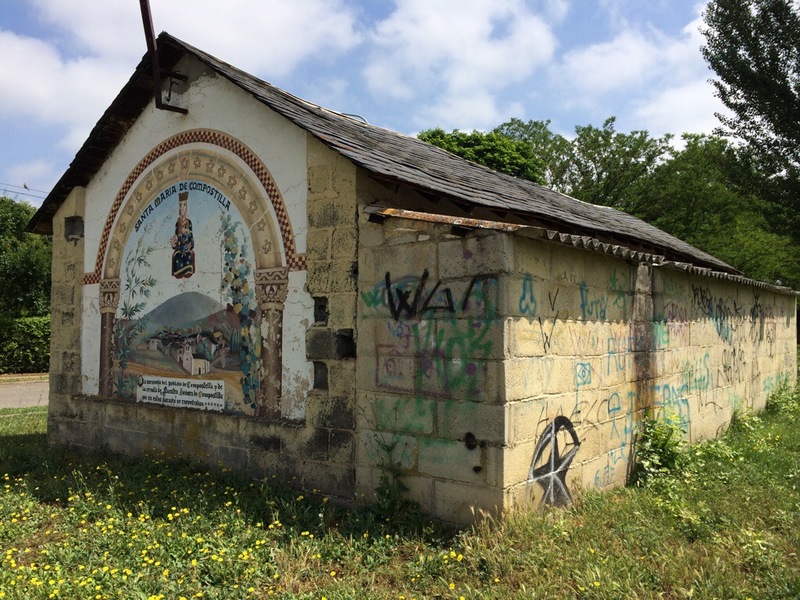 A sadly graffittied shrine to a virgin of the Camino. You can see the mural on one side and the defacing on the other. This was on my creepiest walk, right in the middle of the day. I saw only vandalism and violation and not one other person, either caminante or citizen. It was during the siesta apocalypse outside Ponferrada. Suburbs are the scariest walking of all. <img src=”https://saltworkstudio.files.wordpress.com/2014/06/20140629-091934-33574463.jpg” alt=”20140629-091934-33574463.jpg” class=”alignnone size-full” />This isn’t my sketchbook, but an image from the Templar Library. I was struck by the ancient illuminations. They have a dream-like quality. 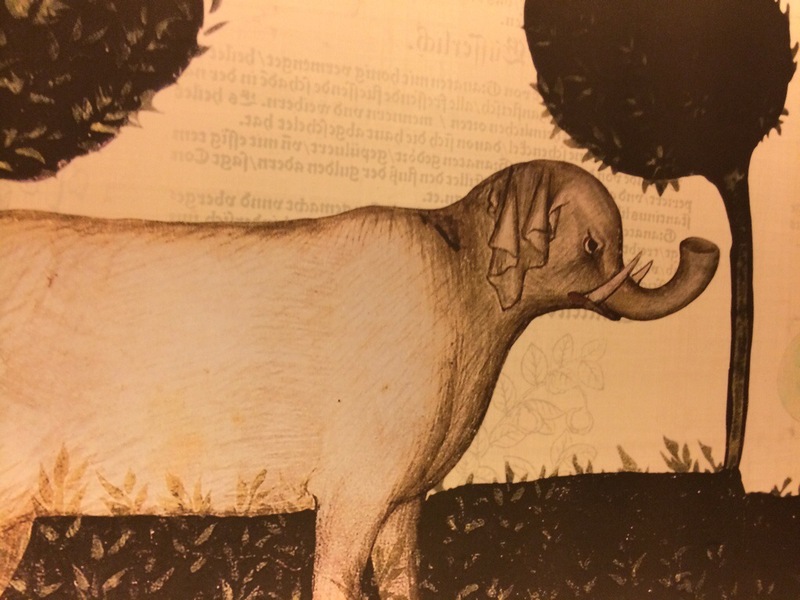 These illuminated manuscripts must be the most beautiful books ever made. Since I last wrote you, I’ve been on the road for four days in the manure-pungent hobbit-land of Galicia. 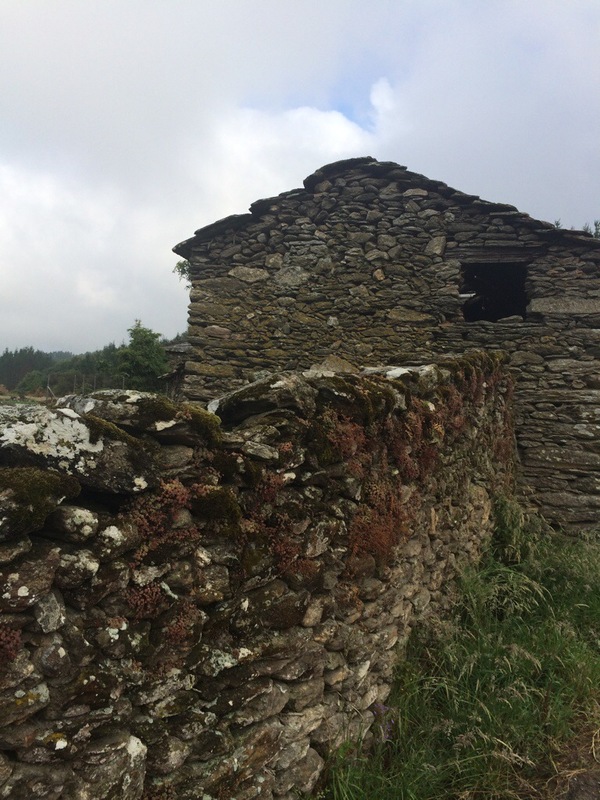 In spite of the thousand years of Camino passing through, it is still remote, with stone houses topped with grey slate roofs, a lot of mossy rock. The photo above is of tombs, many decorated with the twin towers of Santiago: the tomb as a cathedral, which Santiago is. 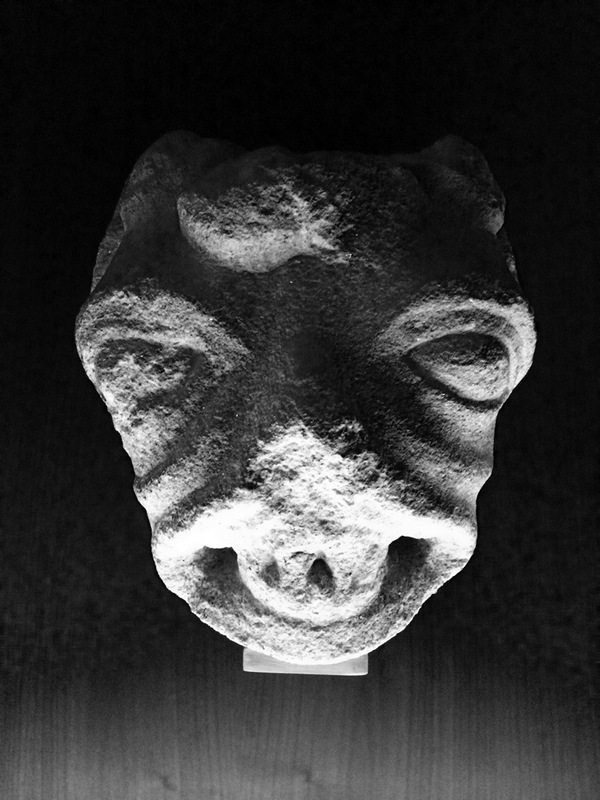 Created around the dubious bones of a discovered saint, and on the site of old Roman cemeteries, there is more than a bit of death built in to the pilgrimage. But nature redeems the melancholy at times. It is spectacular here. I am mostly walking through green tunnels. I discovered yesterday that I could make it rain on me, even when it wasn’t raining. As I passed under certain trees, a pattering would start, as if the tree was raining only for me. It was strange and delightful. Often no drops would fall on me, but water was clearly dropping in a delightful way. I experimented and found out that my footsteps and two walking sticks were enough to send an imperceptible signal through the roots up into the branches. I could feel myself enclosed in a delicate, quivering bubble of green world, where I felt the reality that a flap of a butterfly’s wing can start a chain reaction… viscerally felt it. This tree language felt communicative and magical, as if the trees were greeting me. On the other hand, some trees really scared me. They seemed positively threatening, especially this one with the pentangle hung in the branches and piles of salt at the roots. Witches are common here in Galicia, and with due respect to nature worship, I am not sure all of them are benificent. The Galicians would agree, even though they have shrunk their local witches into little cute souvenir dolls. 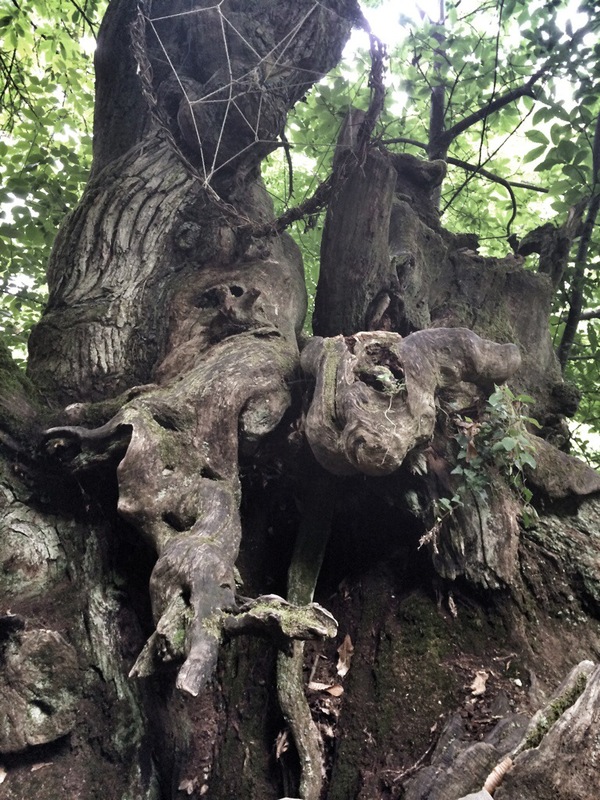 This is the kind of tree that might grab you in these old-growth forests. 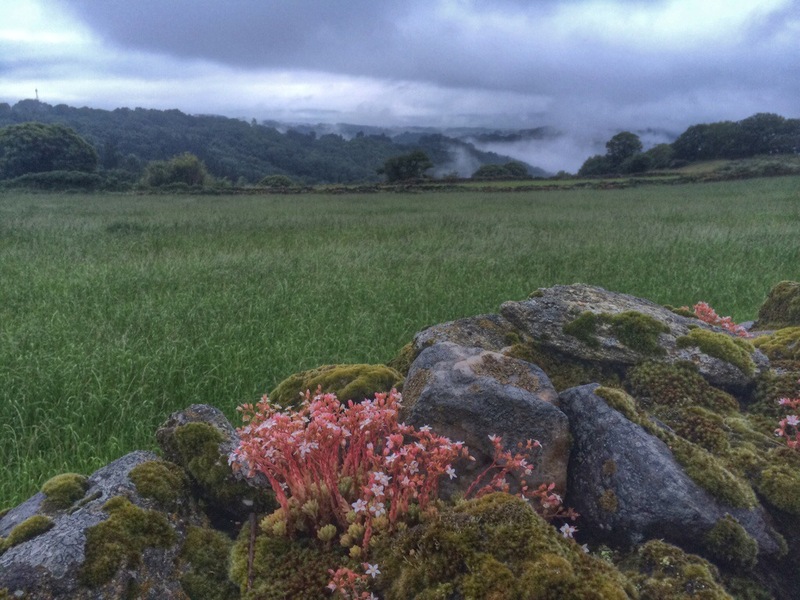 Misty mornings, cold– in the 50s– and often rain. I was walking through the forest and came on a little old lady selling raspberries and a beautiful fuschia colored raspberry liquor in a little bottle. She took me for five euros for a basket of strawberries and a small bottle of whatever that drink was. I don’t know if she was a good or bad witch… I suspect just mischievous. That was a hard day, over 15 kilometers and late in the day. I had to do some business for a morning in Sarria, the biggest city around. Travelers, do you remember how much time and energy it takes just to get into a new town and find an ATM and a store? I was buying a new pancho for the rain, one with sleeves and zipper, like a raincoat that can cover a backpack. 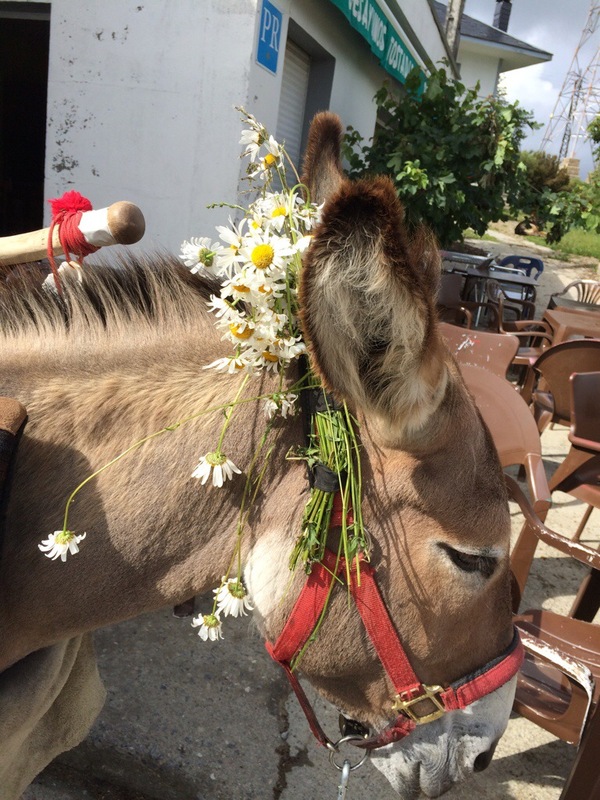 You know you’re doing real travel when the locals don’t really care that much about you. Though not pleasant, you can be sure that you are in the midst of true travel. There is a good tourist structure here and there in the woods though… adequate albergues. But some parts of the day I was just grateful to hear traffic somewhere, anywhere, or see another hiker. I am still hiking mostly by myself…wonderful for contemplation, but sometimes eerie in the green, stony world of Galicia. I can hear the shriek of seagulls outside in the pre-dawn light as I sit writing to you from the ghost cafe in Santiago. It’s a very ephemeral city, forbidding when cold and grey, a huge party town with people from all over the world when sunlit, and everyone, everyone, with strong legs and a look of relief. 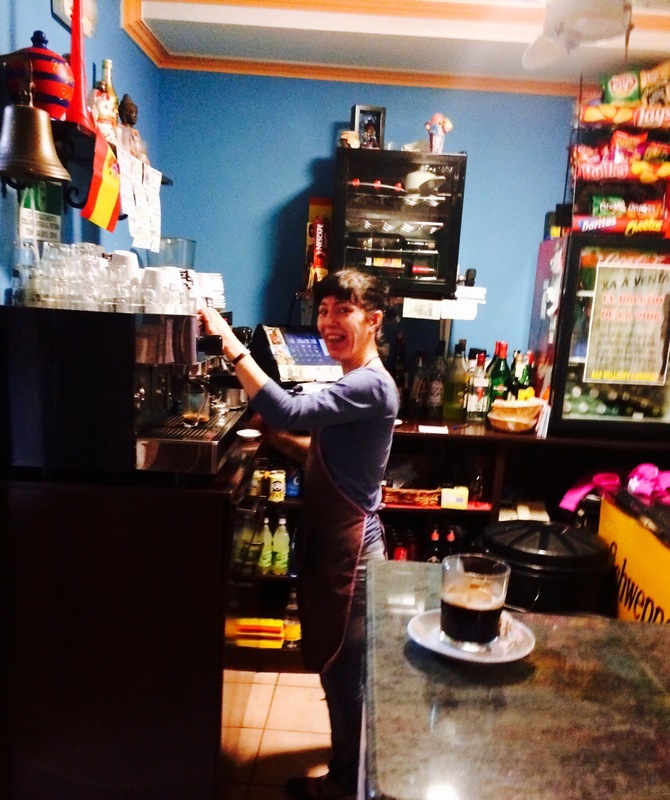 The cafe is actually part of the wonderful Hostal Susa. 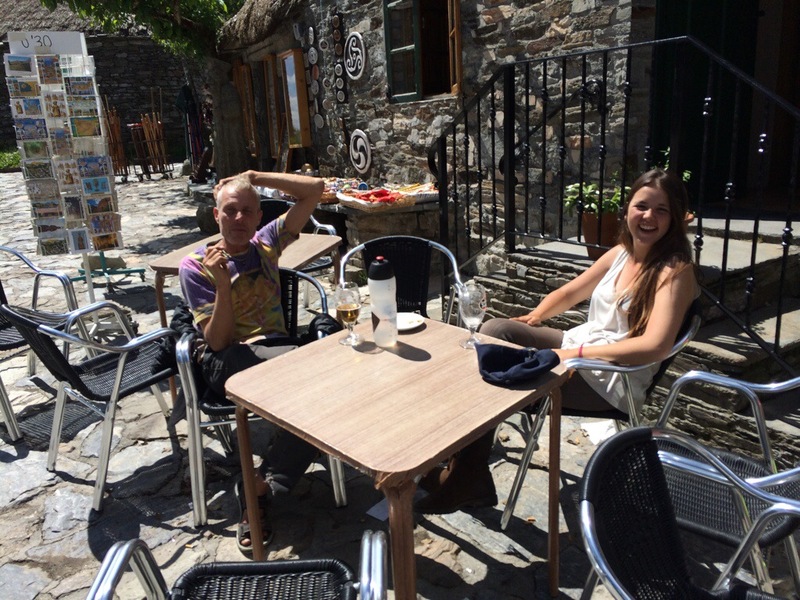 Hostals in Spain are not youth hostels or albergues, but rather grouped with pensiones or lower-priced hotels. I have a tiny, immaculate room with a bathroom in the middle of the old town of Santiago for 20 euros a night… the lowest price yet. There is a bar-cafe attached to the hostal, but visually blocked and closed off from the street. It is only accessible if you have a room, yet two people work there. Dishes are washed, but there is nothing but coffee and scanty, used-up bottles of liquor on the shelf… if you can get in. There is a menu, but when I picked it up, the barman, with a look of alarm on his face, asked me to put it down, as nothing on the menu was available. And yet, I sit here writing to you, with the magic of Spain tolerating me.. I realize I am skipping the days before my arrival in Santiago. I’ll share that in another post. I arrived on July 3, but saved my entry into the Cathedral until 7AM the next day, to avoid the crowds. The seagulls were shrieking and it was raining, with the echo of a Galician bagpipe filling the square. Every pilgrim is supposed to do 4 things, more or less in order. The first is to admire the portal with the Tree of Jesse, designed by the master artist/architect, Master Matteo. There are so many portals to the Cathedral that I had no idea which one that was. Then you enter the vast, new universe of space that is the cathedral. They actually designed it to be a Cathedral of Stars, for Compostella, field of stars. That’s the positive reading. It was really built on an ancient Roman cemetery . Anyway, it is about the transition into other worlds, whether the starry Way or the passages of death. In the old days you could walk up to the Saint and touch his feet. That is no longer allowed, to preserve the sacred marble. Personally, I think that to touch the place where millions have touched with a full heart is worth a lot more than the sculpture. It’s an amazing place. So much of the gothic stonework was painted in the old days, but for some reason the paint is never restored. I know from illuminated manuscripts how vivid the pigments were. Yet the original paint is faded and almost gone, increasing the forbidding aspect of the cathedral. So now I have not been able to do two out of the four things that pilgrims traditionally did. On to number three. This was news to me, but apparently there is actually a chance to touch your forehead to the head of an image of Master Matteo in order to receive divine artistic inspiration! Bring it on, said I. So I set out to search for Master Mateo. But I couldn’t find him, lost in the echoing dampness of the Cathedral. It’s dark in there on a rainy morning. Then God intervened. A German woman cathedral docent approached me and asked in German if I needed help. Apparently there is a mass in German in a side chapel at 7:30 and she thought I was looking for that. She spoke no English, but I could use my German to ask for the location of Master Matteo. One of the towers is under renovation. You can see it here. I had hardly noticed, as any Gothic cathedral has so many towers that having a couple of spares is not a problem. 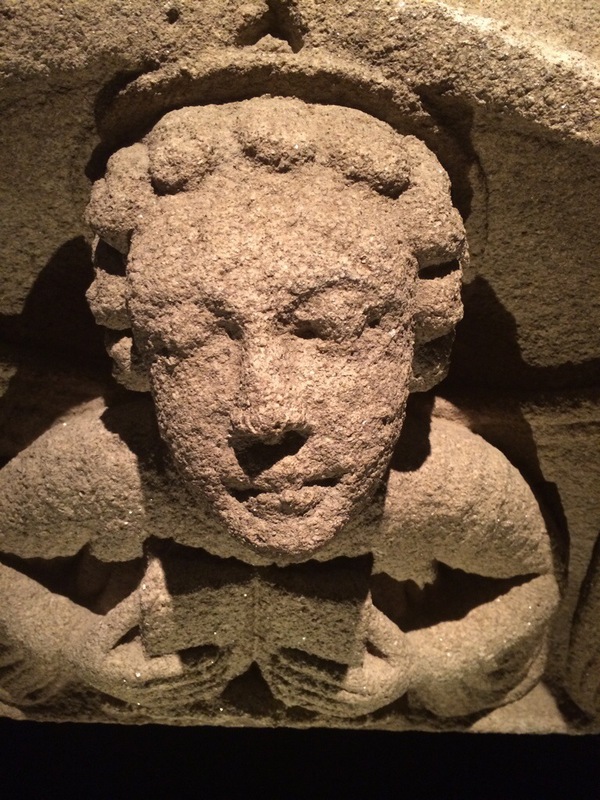 So I went under the draped tower and there, barricaded in darkness, was Master Matteo, a delightful, lovingly executed sculpture around 4 feet high, just right for the shorter midieval pilgrim to lean over and get some forehead inspiration. But there were iron barricades and almost total darkness. So I asked myself, what would Matteo do ? He would find a creative solution. First I used my bendy tripod and a low light program to take a picture of him. But I couldn’t stand being so close to him and not touching him. I reached out my arm, and I swear I was within an inch of touching him, but no dice. Time for another plan. You are talking to a woman who actually managed to take rubbings from Assyrian bas-reliefs under the noses of the guards in the British Museum. This was not going to stop me. I checked the area and no one was around so I stepped through the first layer of iron bar barricades. I was close enough then to press my hand against his forehead. 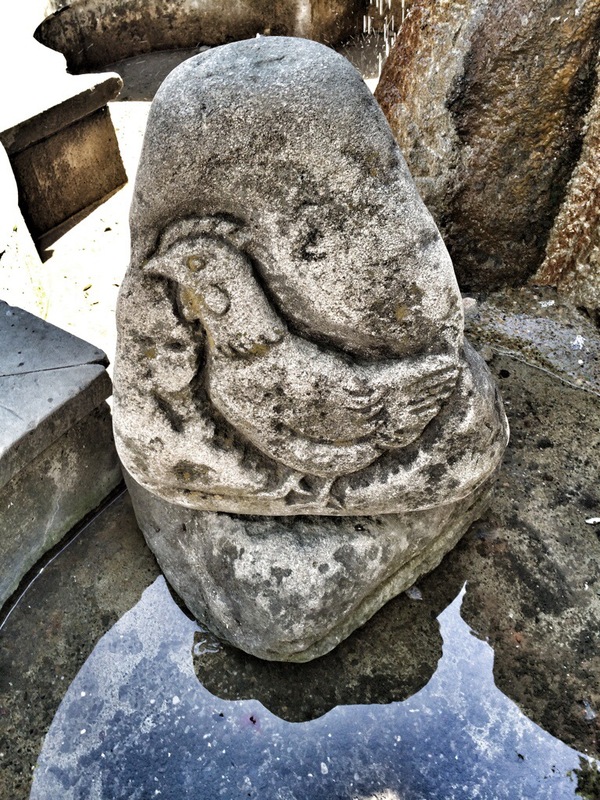 I left it there for awhile until the cold of the stone seeped in, then pressed my hand to my forehead. I could swear the Master smiled. Part of the deal was to draw him as well, so this is my journal page. The last of the four items is to visit the silver box full of bones, and say your prayers. So I did. My timing has been so good… I found out from Severin, the Swiss colossus youth who always knows everything, that every Friday night they have a mass where they swing the giant incense holder. 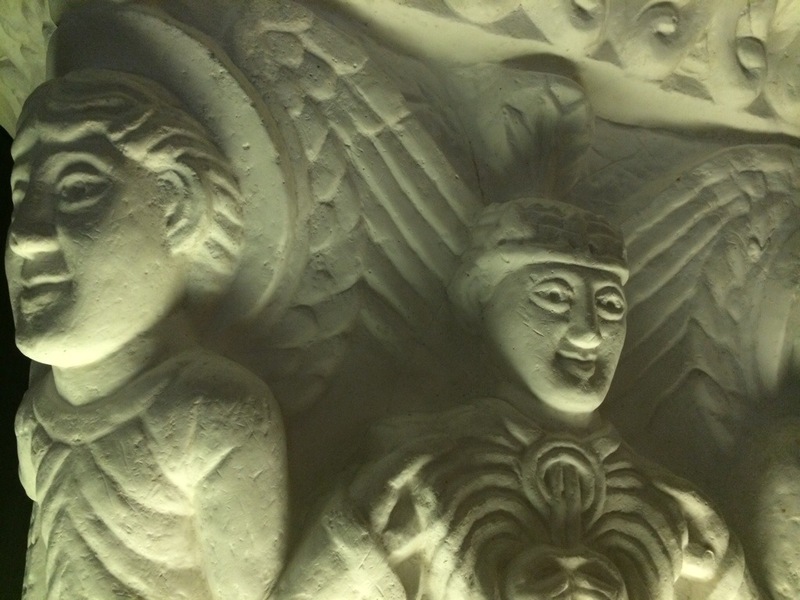 The Botafumerio is an icon of the pilgrimage, and you also saw it in the film The Way. So I went 1 1/2 hours early to get a place in a pew underneath the action, having learned from Christmas in Rome that you don’t fool around with the big masses if you want to get a seat. The timing was good…. the Cathedral filled with around 1200 people. They don’t swing the thing every day. You have to wait through the whole Mass to get to the good part– the Catholic Church knows how to keep people in their seats. They are firm. “Silencio! Silencio!” But finally the B.F. is lowered. Up there in the vast cathedral space it looks around 2 feet high. Then it is lowered and you see that it is bigger than a man. They pour coals into it and heap on the incense, then raise it and begin a controlled swing over your heads. What the films can’t show you is that it is on fire, sparkling with red flame from the bottom, and emitting these giant clouds of sweet smelling smoke: copal and frankincense, if I’m not mistaken. It’s just the most joyful thing to be under… you instinctively duck as it goes over your head. Everyone was smiling and laughing… you have never seen anything like it, and never will again. Talk about an unidentified flying object! 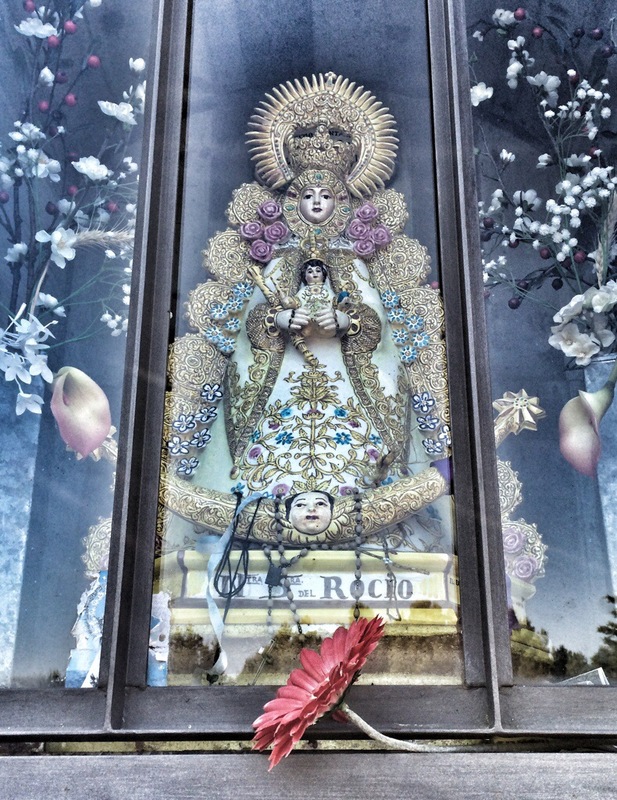 I’m always glad to leave the church… I felt like a ginormous golden Baroque angel was glaring at me through one eye. I wish we could skip the Baroque decoration and just take the music. This photo gives an idea of how full the church was. I feel full, happy, and yes, blessed by the Cathedral. The seagull shrieks are calling me on to the coast, so I’m hopping a bus to Finisterrae, the end of the ancient world. Many consider it to be the natural, prehistoric end of the Way. The two workers in Ghost Cafe have spent the last hours reading the newspaper, and I, the only customer, am ready to pay up and get on the road. I’ll write you from the Atlantic coast, and I’ll tell you more of the saga of my journey. I’m writing you from my favorite cafe at the end of the world, a cheery place to counteract all the endings. Seagulls shriek, cry, bark, howl, meow, and moan; I’ve never heard anything like it, all day and all night. A person with too much imagination could easily hear them as the souls of the damned, wailing before they are carried away. 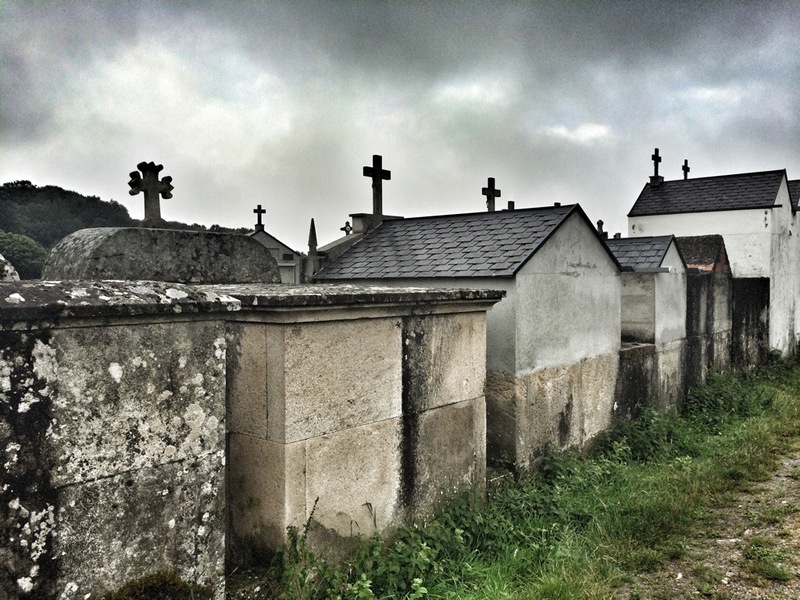 Did I mention that Finisterre is built on a graveyard? Hey, I watch movies: I know what happens when you build on burial sites. Or maybe only Americans notice. This sweet woman just made me a tortilla, which has morphed from a thick egg and potato slice into a thin sweet pancake or a sort of French toast with a little anise in this part of Spain. Yum. I call it the Yelling Cafe, because there are two TVs, and music, and a pinball machine, and everyone happily yells most of the time to be heard. It reminds me of holiday meals with the Edminster side of the family. My father said that his family was too poor for toys so they went in for recreational arguing instead. It’s full of fisherman. You have to like a place that, when you ask for something, they phone to see if any has just come in on the boat. 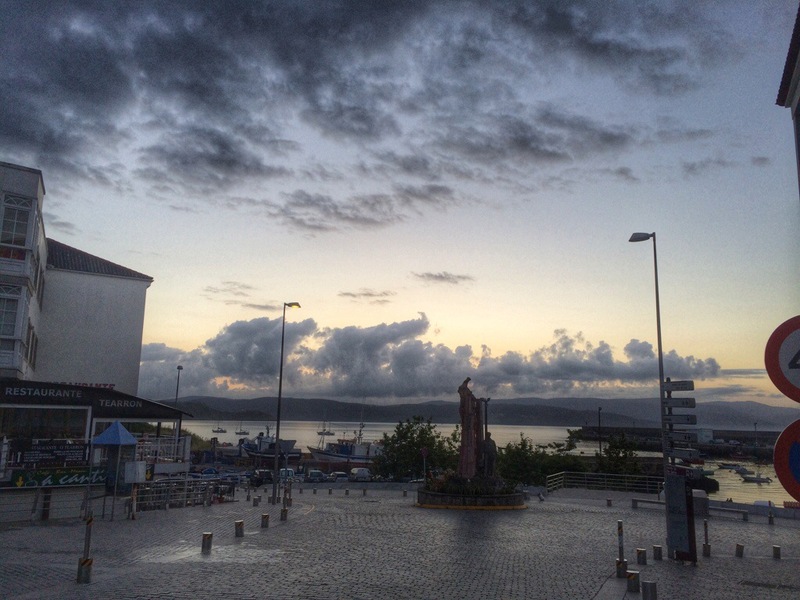 In spite of the cheery Yelling Cafe, I had a hard time with Finisterre, the end of the world. It’s the end of the world of being and pilgrim and transitioning back to being a tourist. I was talking with a Belgian pilgrim and I said, “It may be World’s End facing ahead, but then you turn around and a world is still there. ” The man said he met a guy who was doing a bicycle pilgrimage starting at Finisterre in France on the coast of Brittany, then going to this Spanish End, and from there on to the Portugese Finisterre. I have seen another world’s end, Pacific style: standing on Hawaii’s South Point near Naalehu you face thousands of uninterrupted miles of South Pacific vastness. I do find the place melancholy and rather sad. In spite of my love of symbol and archaic remains and traditions, there’s a point when it all feels like death, drawing the energy of your body out of you. 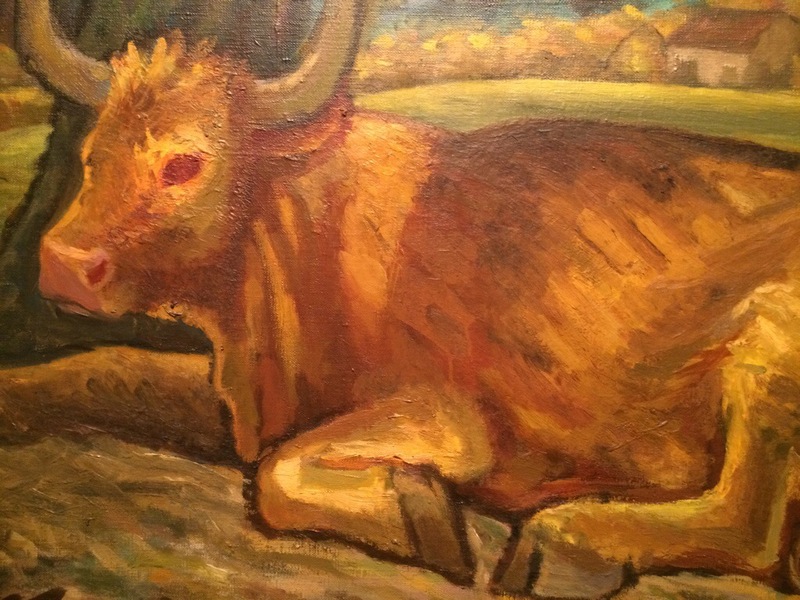 I have noticed it before when looking at petroglyphs or cave painting, or sometimes at the old masters. That’s why we have museums and cathedrals; they are image and tradition morgues so we don’t have to live with these things in our daily life, soaking the immediacy out of our fragile, temporal existence. 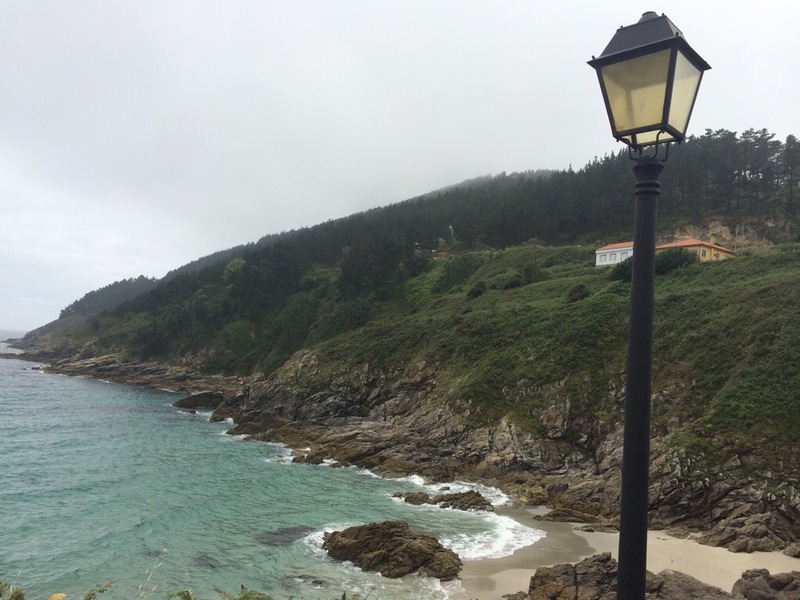 I reached my saturation point in Finisterre; I didn’t even want to see the prehistoric stones or carvings. Looking at the endless reaches of ocean is a bit like looking at cave paintings, or the stars. All these beauties are physical reflections of infinity and eternity .They can restore and inspire, but they can also consume your fragile spirit. 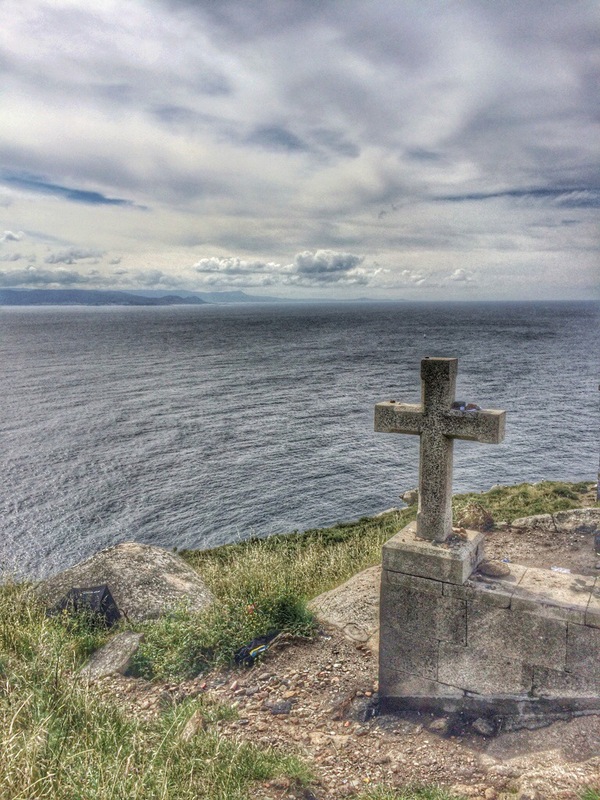 It is said that the souls of the ancients were taken in spirit ships to the Land of the Dead from Finisterre,and the coast is called the Coast of Death in Spanish, both for shipwrecks and for the many cemeteries, ancient and modern, which line the coast. Now I have to leave being a pilgrim behind at the end of the world, and return to being a tourist. 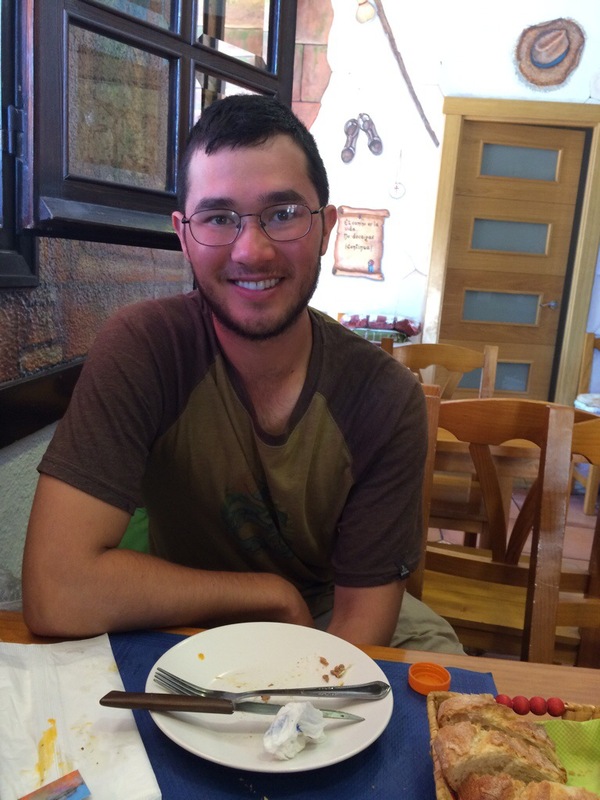 I ended up walking 260 KM out of the entire Camino, walking steadily for a month. 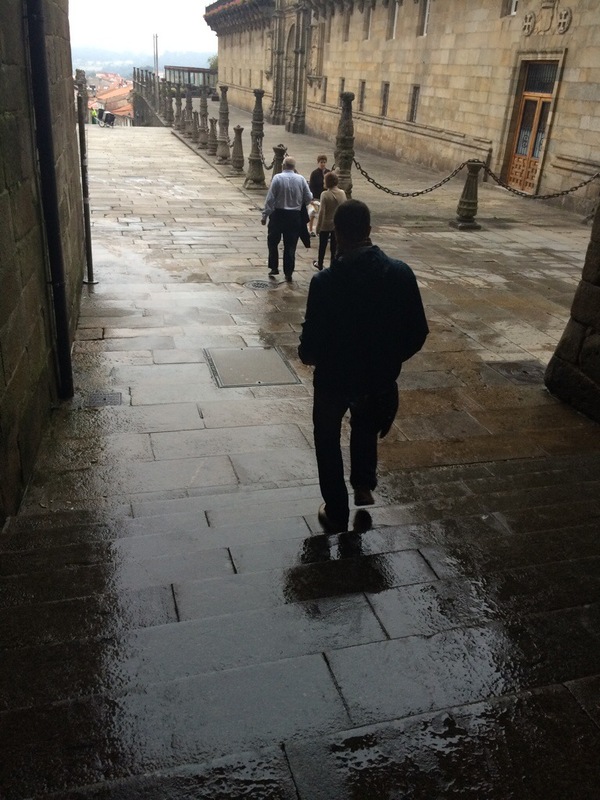 I didn’t get the standard Compostela, because, though I did walk over 250 KM, I didn’t walk the final part. I got to 88 K and found I was no longer enjoying the road. After my long and contemplative walk– I think I was by myself about 70% of the time–it was very disturbing to have at least five times the number of people around, including huge school groups of teenager. It was hard not to judge them. Competition for beds started. After much reflection, I elected to take the bus into Santiago. When I did, I felt much better. I did get a Franciscan Compostela. The monks give them based not on distance, but on whether you feel you walked in the spirit of Saint Francis, which I did. 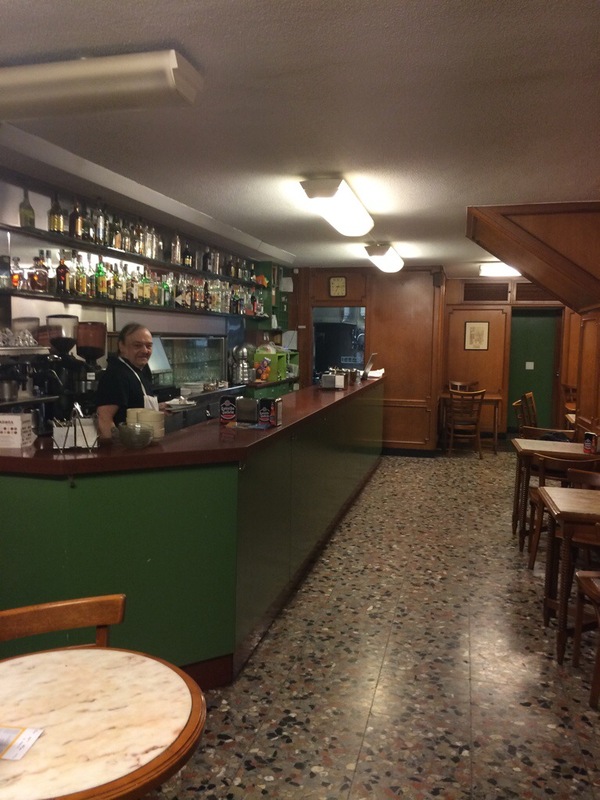 I’m back in Santiago now, in a cafe that feels Viennese… a huge room with chandeliers and original woodwork and rows of easy chairs. I like the city. All cities that have hosted pilgrims have an air of weary sophistication. They have a tradition of hospitality, and no xenophobia; they respect the tourists, and include them. Tomorrow I leave Santiago for Porto, Portugal, then Madrid, then home. 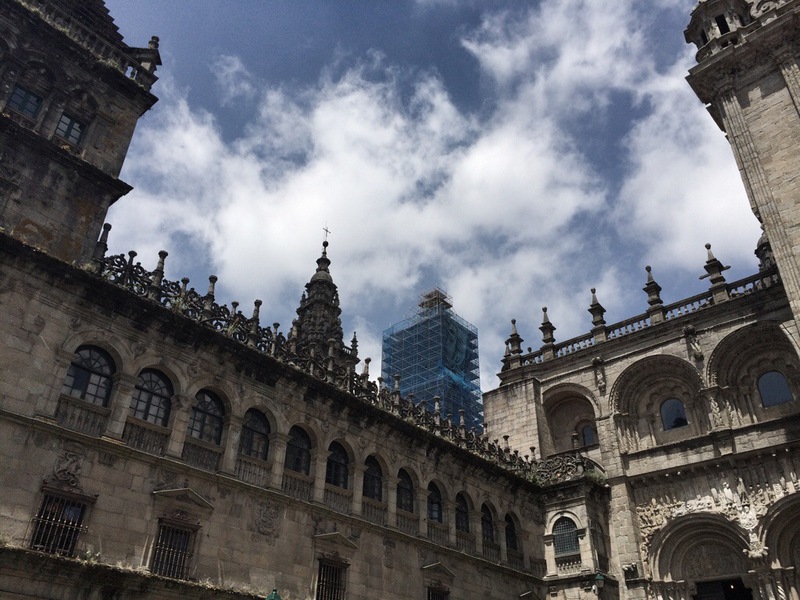 I am now turning the trip into an art museum tour in Porto and Madrid, including the Prado. 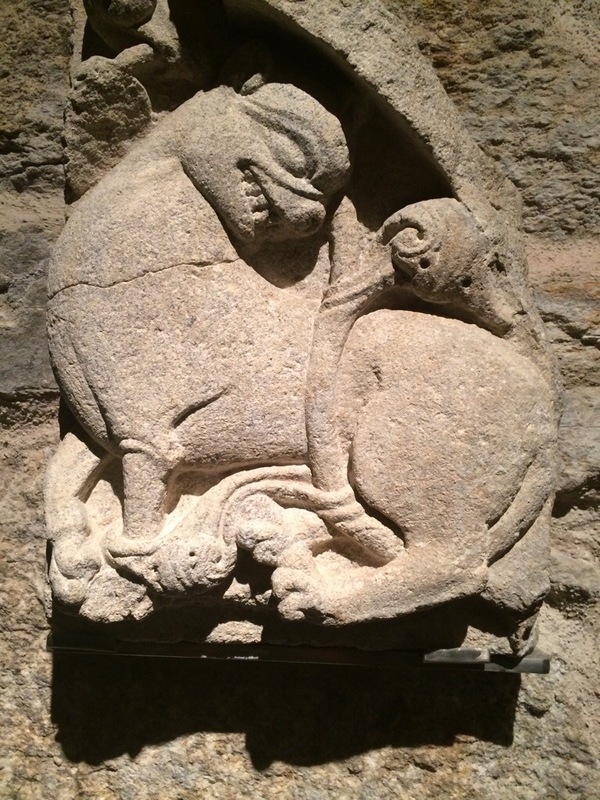 I loved the Cathedral Museum and the gentle beauty of the mideival art. I’m sitting here in the Santiago bus station, waiting for the express bus to Portugal. 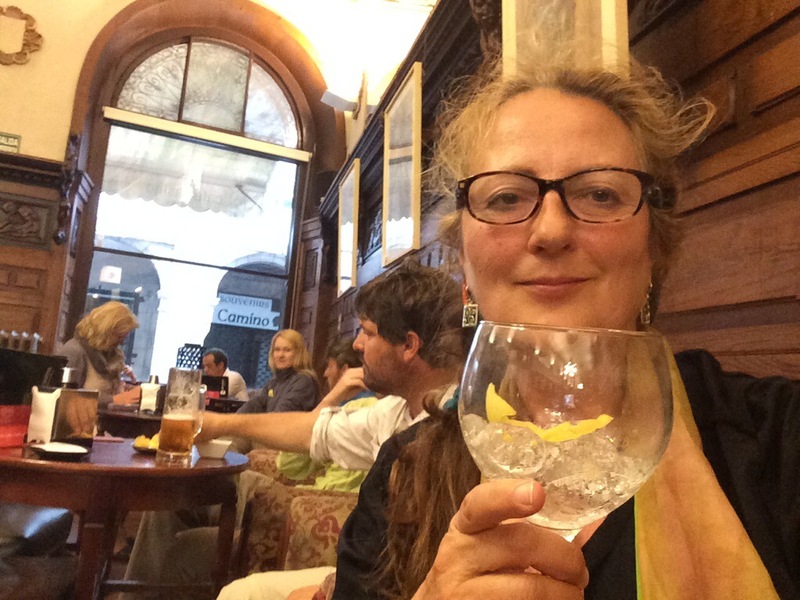 I thought I’d take a moment to share with you some thoughts about my Camino. I made a list of reasons to walk before I left, and reflected on them as I walked. But I’m one of the lucky ones. Two of the main reasons I walked were out of gratitude for my beautiful life, and for enjoyment. People walk for many reasons. Many are in the midst of personal catastrophe, change, or deep loss. I met a woman who, in the midst of recurring cancers, was left by her husband for another woman. She had never been alone in her life, having married young. Her pain was tangible, but walking seemed to be keeping her positive in a way nothing else could. She said in amazement, “I still have my life. ” Another man carried the picture of his wife on the back of his pack. She passed away a few days before their 50th wedding anniversary. He was walking joyously in her honor. Several people were carrying remains of loved ones with them. This post has now crashed twice on me, and I’ve lost blocks of writing. But I’ll try one more time to continue. 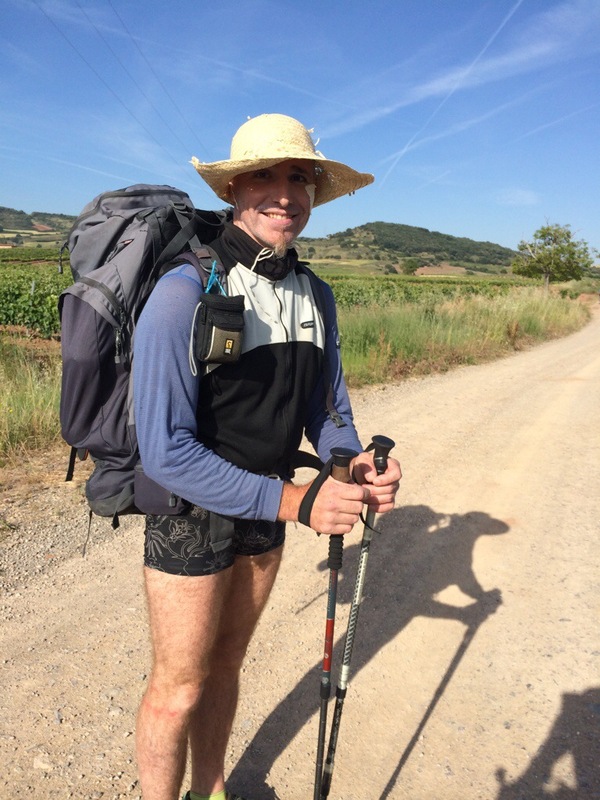 Several people have asked me to comment on some of the practical aspects of my June-July 2014 Camino. I must emphasize that these are my opinions only, and that many will disagree. There are many available sources to use to form your own opinion. Money: from California estimate $1500 or more for a round trip ticket, $300 more for travel in Spain (train, bus, taxi). 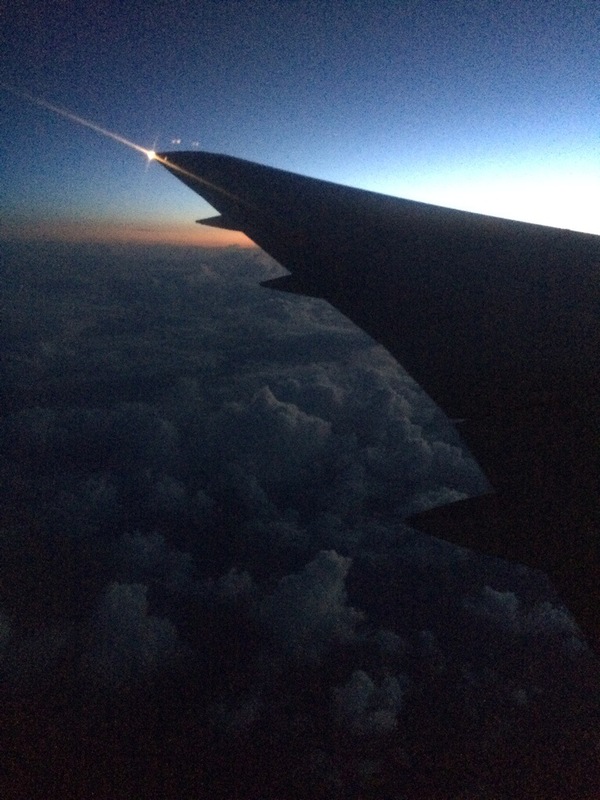 For a 40 day trip, I would budget $60 a day…. around 40 Euros. This is high, but you will want the occasional hotel and dinner out. That makes $2400 + 1800 = $4200. You may also spend 300-500 on the right pack, shoes, small sleeping bag. Make sure you have a good working credit and debit card. Credit Unions have far lower fees than regular banks for withdrawing cash or using credit cards abroad, so get set up with a credit union. You can of course spend less daily. I often relied on a tomato salad with bread and tuna , fruit on the side, that I made in a hostel kitchen. Time: I would give it at least 40 days for the whole thing. The Brierley guide is excellent, but if you want to stop to smell the roses, I would walk two days for each of his stages. Choose shorter stages, or choose a portion of the route to walk. Distance: If you were backpacking in the Sierra, you probably would not walk 15 miles a day. Unless you are sure you can do it, 30 km a day is a long, long way. I saw many people injured and ill from trying to do too much. Also, starting in the Pyranees seems to me to be a point where many people injure themselves or get ill. Go shorter distances, start very very slowly, and WALK AT YOUR OWN PACE. This may not fit the guidebooks. I must emphasize that it is crucial you do everything you can to remain healthy. I saw so many people almost punishing themselves, and harming their bodies, on this trip, pushing on when they should have stopped. 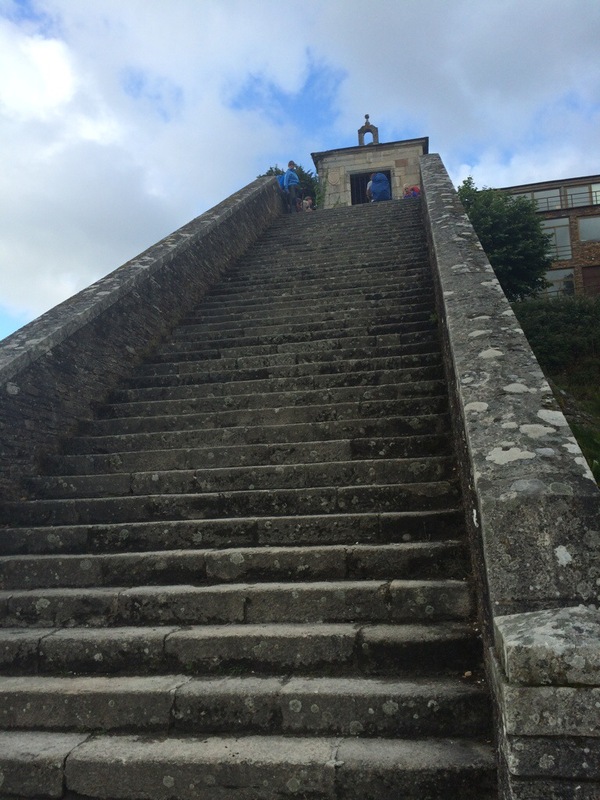 You get a Compostella for walking the last 100 km into Santiago, starting in Sarria. So thousands of people, and schoolchildren, choose this route because it is the easiest way to the document. The path is very crowded and is a very different vibe than other parts of the Camino. That is the rule of the Catholic Church– walk the last one hundred. 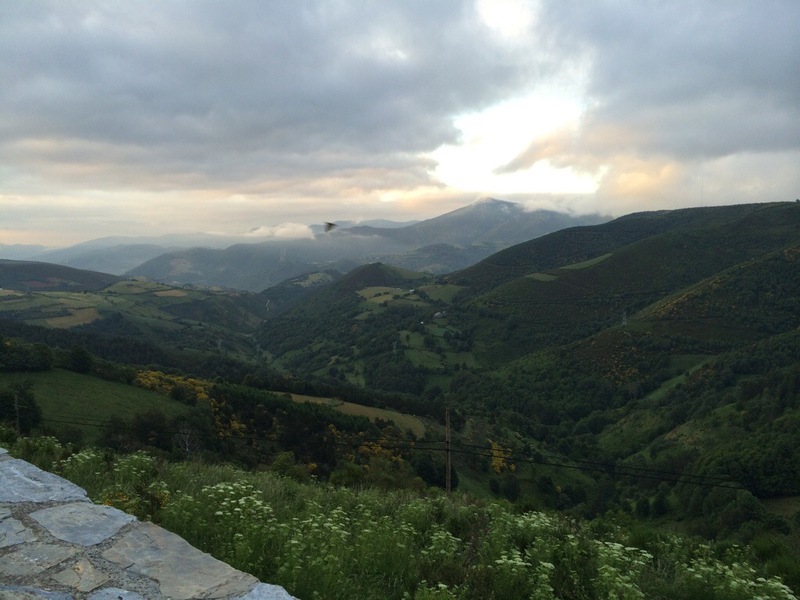 The Camino is far more than the document. You might consider an alternative route and skip the Compostela. God will understand. 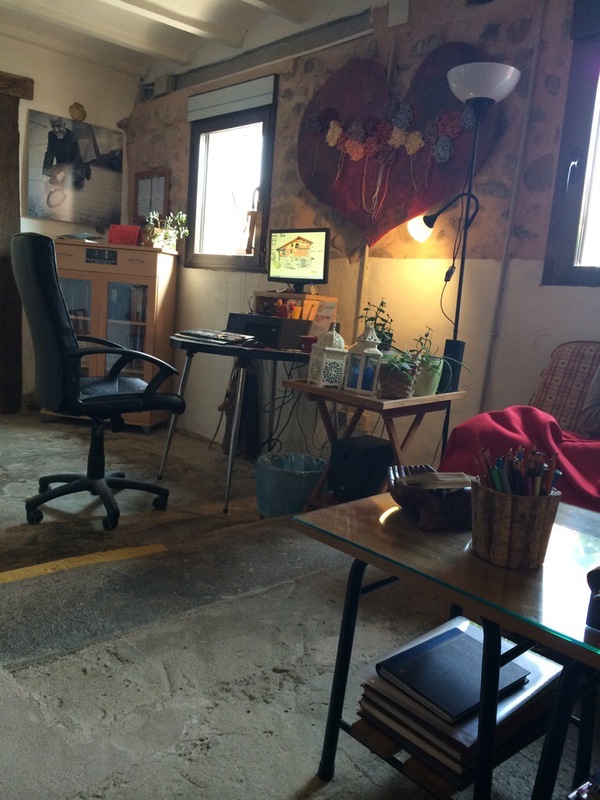 Here in Porto, Portugal, I´m sitting in a beautiful hostel, a real hostel this time, that has won many prizes. It´s in a renovated townhouse in the center of old Porto: high French windows in each room, billowing white curtains, views of the port and river. I am in a woman´s dorm of six, and am about to go upstairs to a breakfast, up the old wooden stairs to the rooftop kitchen area. Once again, I feel like I am borne along on some gentle river of right place, right time. And there´s a computer that seems to work. I left things behind, and lost things, on this trip. Let´s start with the physical. That pack is your home, and when things are lost or stolen, the shock is disproportionate. I lost three items, probably because I left them behind~~ sarong, prescription sunglasses, and a pair of underwear. This whole trip I have been experimenting with flow. I decided that when things went wrong, that was a signal to stop and do something else, in other words, to actually change something. I think it was Einstein that said you can´t solve problems on the level they were created, but have to step outside them to another place. This loss of items sounds laughable when I list it, but these losses caused my stomach to lurch. In the damp weather, having only two pairs of underwear left me no margin of error for drying them. The sarong was my security item~~ scarf, pillowcase, bedcover, blanket, modesty while changing, and a curtain for my bunk if I wanted privacy. Oh, and it was my towel too. And sunglasses. When I encountered bad events, feelings, and bad days, I had the time to do a few existential experiments. My idea was that if things were going wrong, or I was freaked out, I could change my ideas and plans to something that felt better. This sounds so simple, but often in life we are bent on a course. If you have an awful work day, you stay at work and tough it out. But I didn´t have to do that here. So when I lost things, or became fearful of hiking alone in the green, dripping Galician woods, I could read these as gentle nudges to change plans. It worked well. When I got an infected blister, it gave me two days in a hotel room to reconsider how I approached the walk. I think one reason my walk was so wonderful is that I let painful signs actually give me a message to change, and I could act on them. I also had some bad dreams on the Camino. I think that we brush through layers of religion, history, blood and war when we walk through these places. 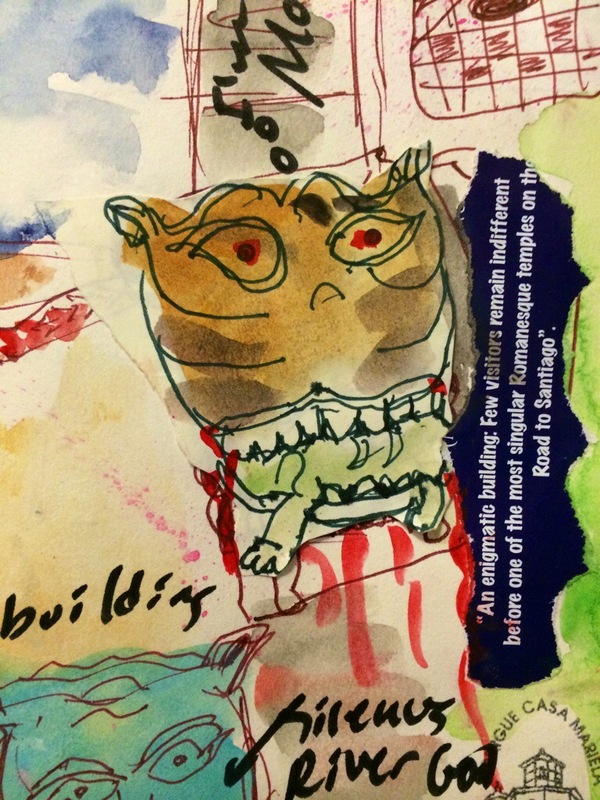 The cathedrals are full of blood, bones, skulls, body parts, and monsters, the gargoyles. When you start to align yourself with the good, I think the shadow can be activated. I am used to this. I often have bad dreams when I start innovative creative projects. When you step outside your comfort zone, your subconcious mind knows it. There is often a kickback, like firing a gun. I believe all dreams are meant to help us, and are messages, so I don´t worry as much about uncomfortable dreams as I used to. 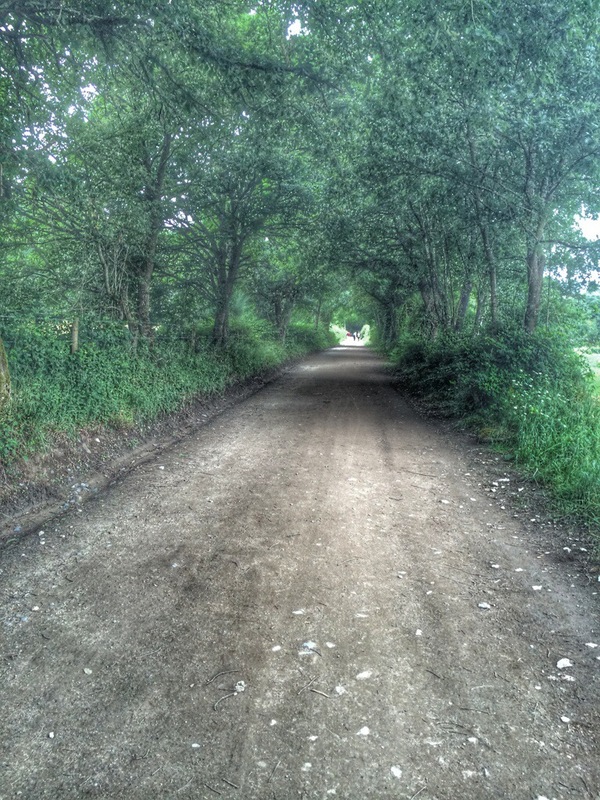 The Camino is a metaphor. How wonderful to leave things behind! I could leave the dream in a church, or at a tree, or in a cafe, and hike on. All of life is a process of leaving things behind. We can read that as loss, or a new chance. I did my final leaving behind of deep things at the alter of St. James. I left behind the same things the ancients did: old wounds and sins and temptations, atonement. I feel like I literally left them behind for the saint, or history, or nature, or God, to return to the cycle of the universe. We leave things behind and face the new day freer. By the way, after I started this post, I found my blue sarong in a ball in the bottom of my pack! My friend returned! Ah, synchronicity. Go figure. I think I opened Pandora´s box when I asked for questions! Here we go. 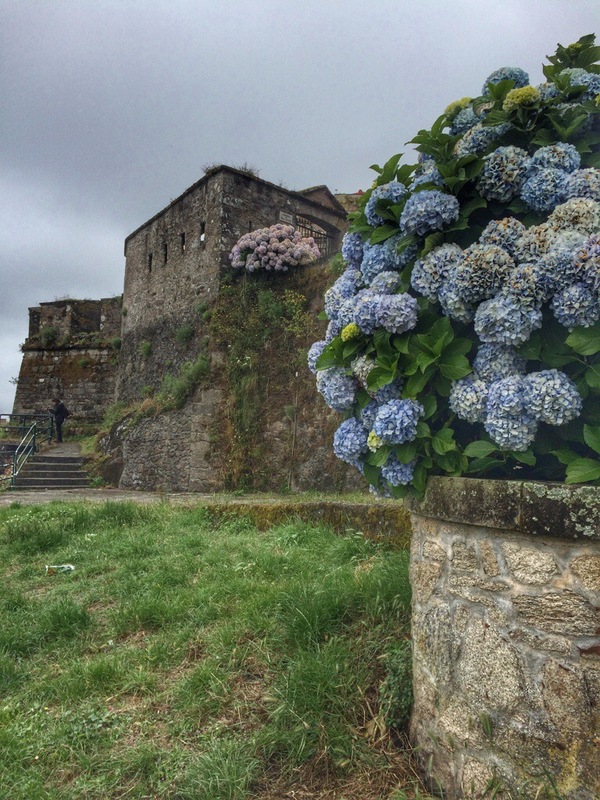 I´m loving Porto… parts of it remind me of Naples. 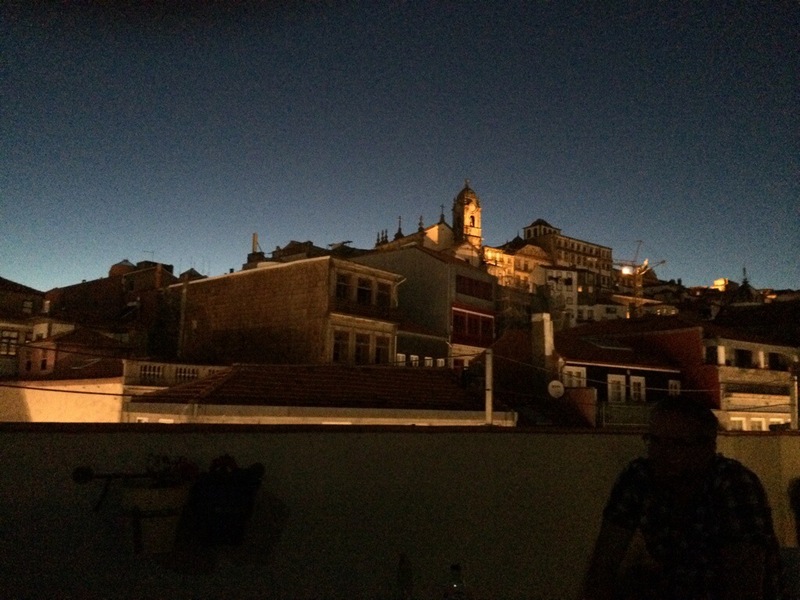 And it´s warm, so to sit out on the roof terrace at night, surrounded by lights, is a great pleasure. 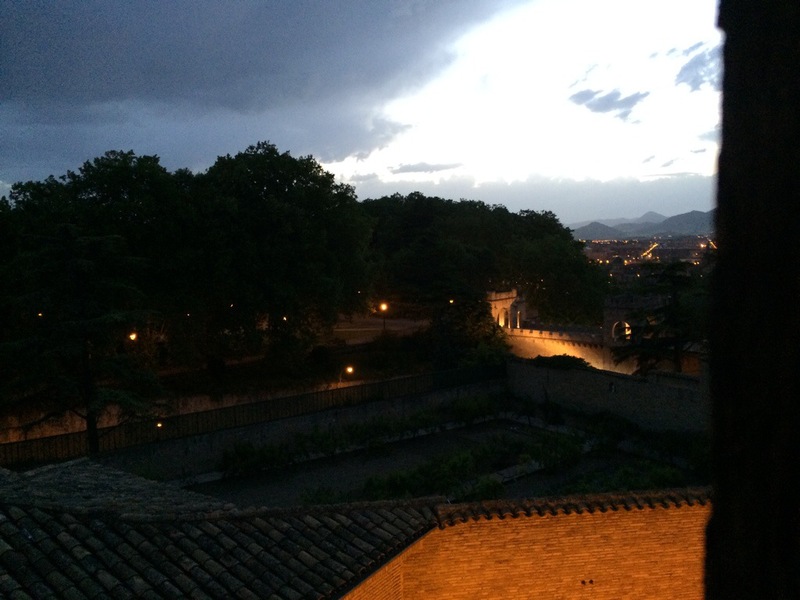 The first photo in the post is from the terrace at night; I´ve enjoyed three nights of this. 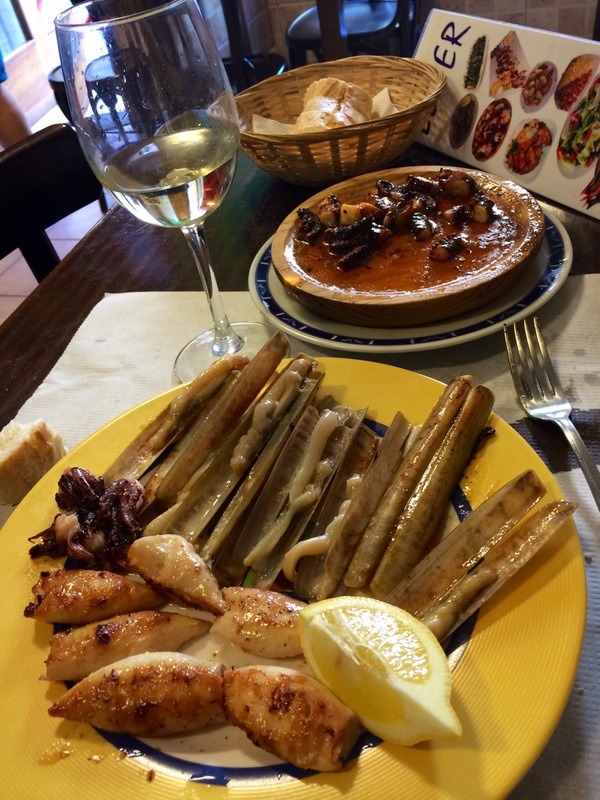 Was there anything you would have done differently to prepare for the Camino? I think I was okay with my prep. I started training in January for a June departure. The best thing I did was to learn how to use trekking poles properly. This sounds simple, but it´s not intuitive. Though I´ve had an ACL operation on my left knee, and my ankles are vulnerable, I had no trouble at all with joints or muscles. I used little leather kayaking fingerless gloves with the poles and that enabled me to use the pole straps easily and well. I saw a lot of people using two poles improperly. Don’t bother to buy them right before your trip. If you don´t practice with them so you are comfortable, it will provide no benefit. In the future I would BRING A SMALLER PACK. I found that my 45 liter plus pack was on the large side. Everyone always brings too much gear and has to leave some behind. I was so jealous of people with smaller packs. Mine, however, was smaller than some. Don´t go for superlight weight at the expense of comfort. Do not bring anything that is the slightest bit uncomfortable. Don´t bring dressup clothes… you won´t use them, not even a skirt. Buy something new when the Camino is over. Ladies, one nice scarf, one pair of earrings (I broke two pairs underway) or your one piece of jewelry, and a lipstick or eyeliner will make you feel like a queen. The best things I brought was my iphone, a Joby Gorilla bendy tripod with a phone holder, and a full-sized Brookstone folding wireless keyboard. I didn’t need an ipad with this setup, and I didn’t need a camera. It also made strangers come up to me all the time and take notes on the setup! 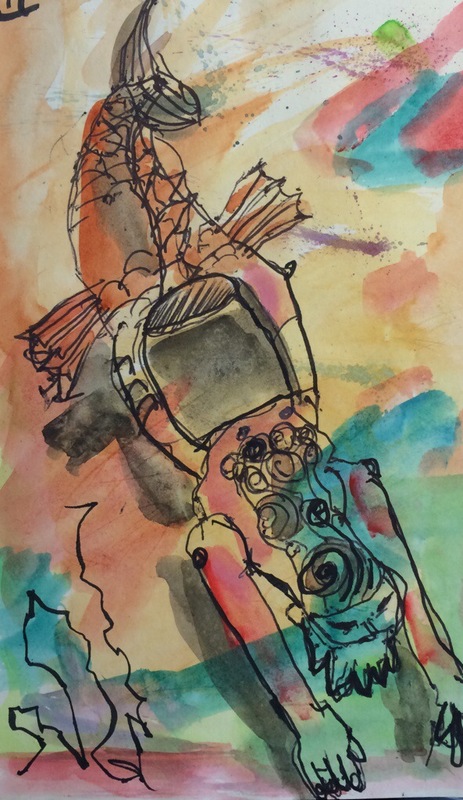 I brought a semilarge sketchbook and was happy with that, a small set of watercolors. I liked having a sarong along as a towel, privacy shield, scarf, skirt, blanket, picnic blanket, and so on. Many Europeans carry a smaller pack and a larger waistpack. I used a larger moneybelt in front, under my shirt for easy access, for passport, credit cards, cash and phone. You may not like the look of a waistpack, but they are secure and very practical. Don´t carry your phone in your pocket, loose. Zip it away routinely somewhere. 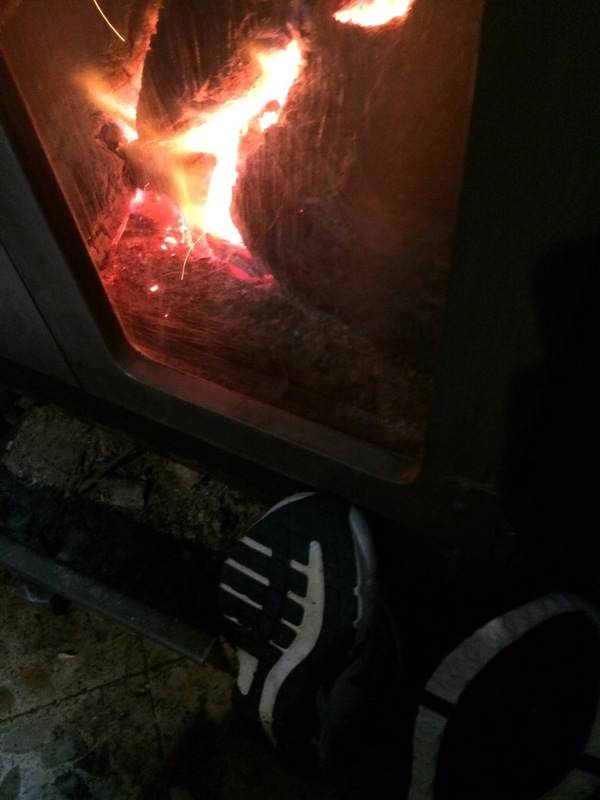 Hey folks, the Camino is COLD in the summer. Bring an extra layer. I would bring a light Merino wool top and leggings…. spiffy long underwear… at any season. I only brought one pair of pants and the leggings… worked well. By cold, I mean in the 40s and 50s. Even if you don´t use them in the warmer parts, you will in the mountains and Galicia. To really prep, you have to hike a lot with your pack and your boots, with a fully loaded pack and poles. By the way, I wore runners, and did okay, but I wish I had taken boots. This was not necessarily for ankle support, but because parts of the trail are quite rough and stony underfoot.I felt I had to be careful as I walked of the bottoms of my feet. But you have to decide for yourself. I had two blisters once, then not one other the whole trip. BRING A GOOD PAIR OF WALKING SANDALS as your alternates. I took adjustable Tevas. Don´t bring flipflops… I met at least 4 people who threw them out and had to buy better sandals in Spain, because your feet swell and can need pampering and support after walking. I also enjoyed having a somewhat hardier daypack than the ultra super flimsy ones… I got a packable one by Eagle Creek. Also, all the Europeans have little ultralight synthetic sleeping bags that pack to the size of a liter of water. They are not common here, but my Marmot nanowave 55 was quite similar. Your sleeping bag should weigh under two pounds. If you are older, or a larger person, your pack will be bigger. I bought an Altus poncho, which is a raincoat with a hump in the back that goes over your pack, in Spain, and I loved it. They are not made commonly in the USA yet. You can buy an Altus and a sleeping bag in Europe before you start. Take MORE TIME and more money than you think you need. This is standard travel advice, of course, but be willing to be flexible with what your ideas are for the Camino. You probably will want to or have to change plans. I didnºt reserve anywhere and was glad. You can always use booking.com a couple of days before. Walk at your own pace. You´ll see folks doing 40 or even 50 kilometers a day. Let them. Use your smarts and intuition to tell you where to start and end. Is it better to go alone or with another? It depends, of course, but I have so say that for sheer contemplative time, going alone is great. You have to be in tune with your hiking partner. Many women go alone. It is just interesting to go alone with your thoughts and your conversations with the Beyond. It is very safe for women, especially if you are not in the first bloom of youth. Apples and oranges, alone or together: It´s your Camino. Most useful gear: a set of around 8 large safety pins to use as clothespins, and an elastic travel washline. You need the pins to keep your clothes on the line when thery´re hanging out a third story window or whipping around in an alpine wind, and you can use the pins to pin the still damp clothes to the outside of your pack. I prefer thick hiking socks and they take a long time to dry. I took a small shred of beatup towel to use first to dry my body, then throw on the slippery floor to stand on. All the showers are tile and tend to be dangerously slippery. I carried a regular old bandana everywhere and used it for so many things. Often bathrooms have no soap or paper towels. Mentally or emotionally, what would I have left behind? It´s easy to whip out pat answers to this one. You need a lot of patience with yourself and others, and to leave judgement of yourself or others behind. I saw a lot of folks get into trouble with a competitive feeling, especially when you´re older and less fit and comparing yourself to athletic youngsters. But I will rant a bit about an attitude that caused me personal problems. This may not sound very spiritual. I wish I could say something more enlightened-sounding. The thing that caused me big trouble was taking a tourist approach to Camino lodging rather than a pilgrim approach. The pilgrim approach is to take what is there, be grateful for shelter and company, and to laugh off any problems the next day. After all, it´s only one night. You don´t have to rush or reserve or prefer or angle to choose a better place. You know God is taking care of you: trust. The tourist approach is to read ahead, to plan, to try to figure out what might be the best place. Of course, you want to stay somewhere that is not horrible. But most hostels are fine. I found that when I tried to pre-read, angle, plan, or consider reserving, it did not do me any good at all. Rather, the opposite occurred: I became critical, pissy, and discontent with what I got. I am not even sure planning has that much to do with it. I am sitting here in an exquisite townhouse hostel, a Porto villa from the 1800s, and I am only here because it was the only one that kept popping up on Booking.com, not among my first choices. I personally wish I could have left this demanding, deserving, entitled feeling behind. As a pilgrim, you take what is there, and you are SO HAPPY just to stop walking. My worst mental problems came from confusing being a pilgrim with the comforts of 21st century tourism. True hospitality is so simple. 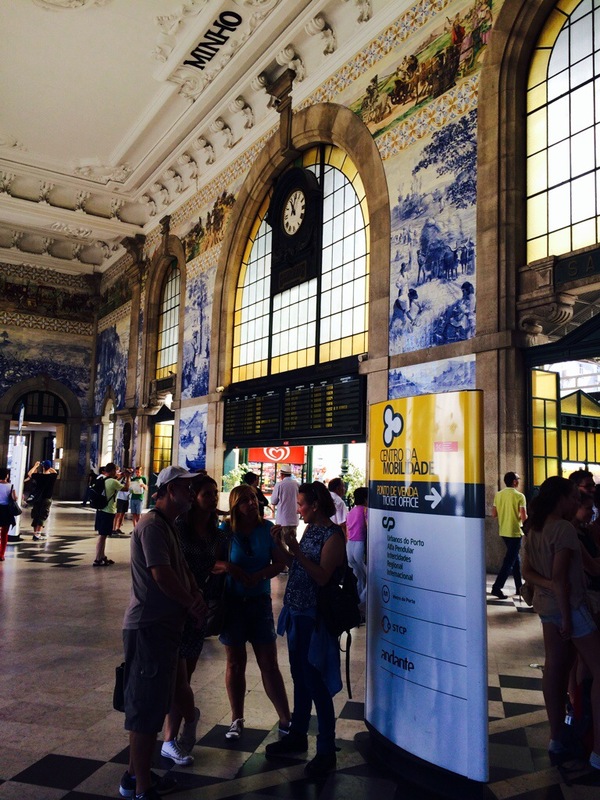 I´m heading out of this gorgeous station in Porto, Portugal to catch an overnight train to Madrid, a sleeper. I can count on the fingers of one hand my overnight trains– once to Paris, once to Cochin in South India, and now once to Madrid. There is always a romance to it, even if it´s just a little sleeping berth. I want to wind up my Camino posts to you. I am not really sure I can answer all your questions. 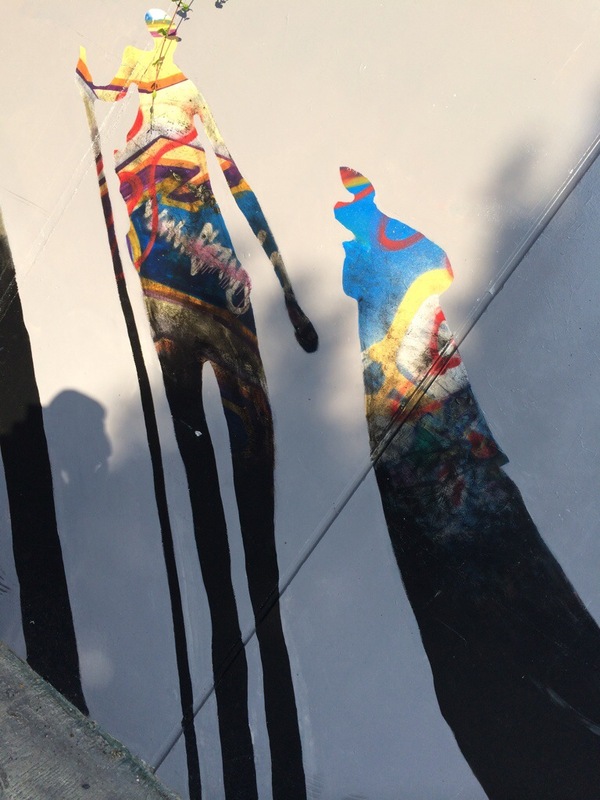 The ones about art and change will have to play out in the future. 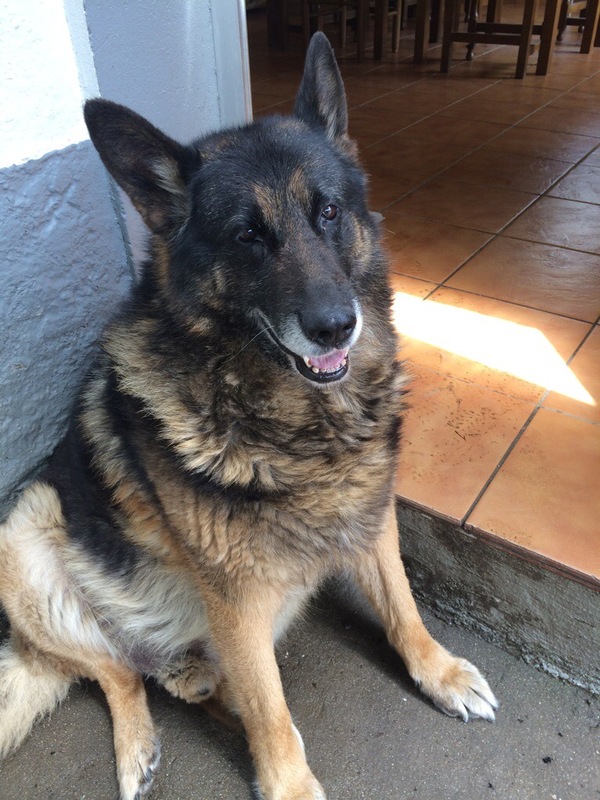 I talked for a long time to Koos, a South African now living in Switzerland. 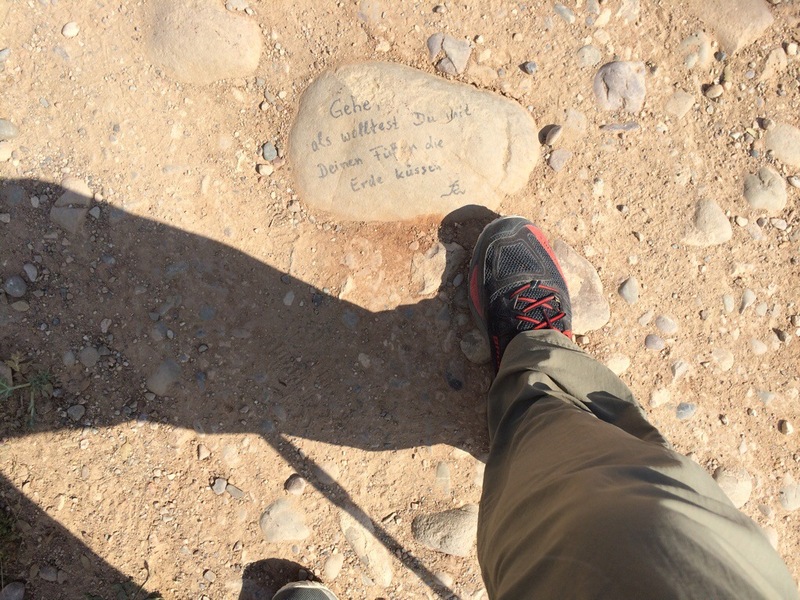 He hiked from Geneva to Logrono, Spain… 1200 km? A long way, anyway. 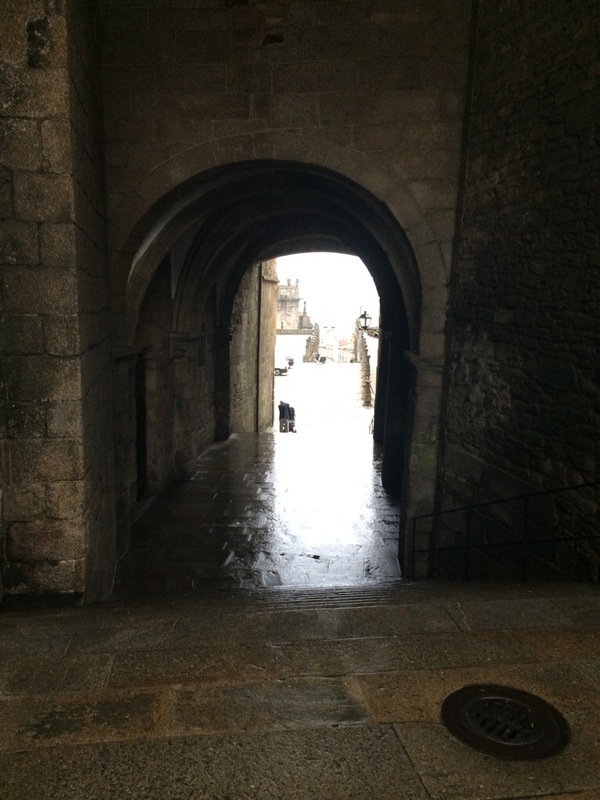 He did not finish the Camino in a classical sense, yet I was struck by our similarities in experience. What I want to say to you is this. 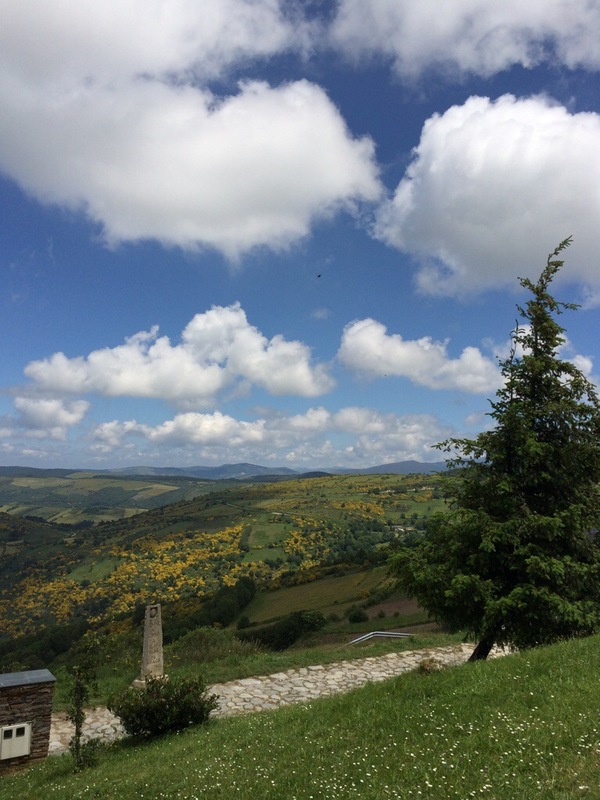 On the Camino, every day is like a world. Koos and I both had the experience of worlds of thought and contemplation opening through the walking. I see each day of the Camino like a drop of clear water teeming with event, yet magnifying a certain aspect of thought. Connections are made. You are walking in nature, so it´s healthy; beauty and your physical movement work together to support you. Only connect. It´s better, for me, than writing in a notenook or talking to someone. It´s as if you walk further into your purpose. We lack the time for contemplation in our lives. Walking is one way to give that time back. I believe it makes a difference that we name it a pilgrimage, and to do it for a month or more. The historical and religious resonance supports us and makes it sacred. Everyone gets something different according to their needs; my insights might interest you, but they won´t be yours. I´m winding up my trip now and may not write again, but I may store away some impressions for you from the Prado. 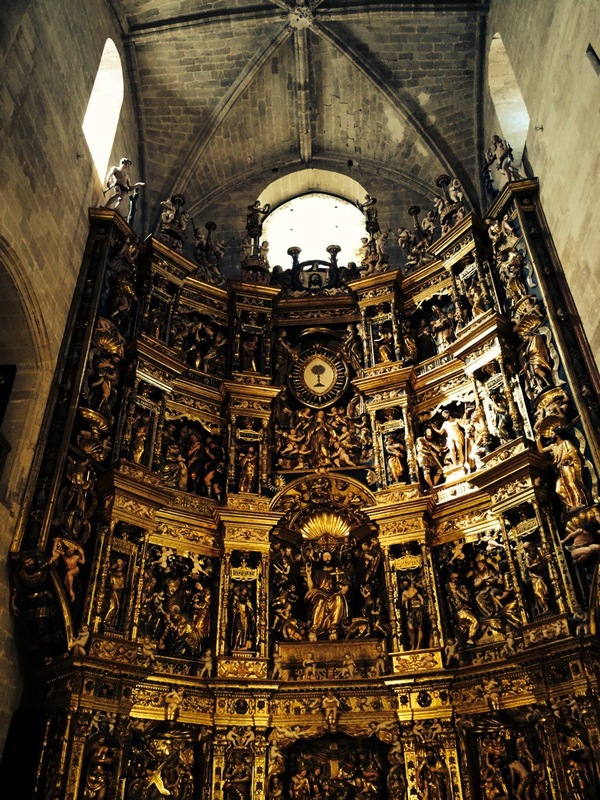 I doubt I can walk through the world´s great museums as gracefully as I did through the days of the Camino, but I can try. We both had the experience of childhood memories comin g up. Thereºs time to really think about them. You are supported by the activity, so the deep emotions can come up and go through you as you walk. Many people report memories. And you slowly have the chance to observe how you order your world, to take little signs and signals from nature, or from the Great Mind, or God. My next door neighbor Neil is walking the Pacific Crest Trail for five months. I wonder if the experience is similar? We both carried with us a list of three goals. They are private: I won´t share them with you, and he didn´t share his with me. Slowly, as you carry these things with you as you might an object in your backpack, they may transform. New metaphors, meanings, and interpretations of your life occur, all within the great open book of nature. I think it´s important that we name it a pilgrimage. ^The historical and religious resonances support us and gives it a lovely weight. And it´s important to go for a month or more. I went with the love, support, and daily Facetime conversations with my husband Scott. Scott, thank you from the bottom of my heart for your support. 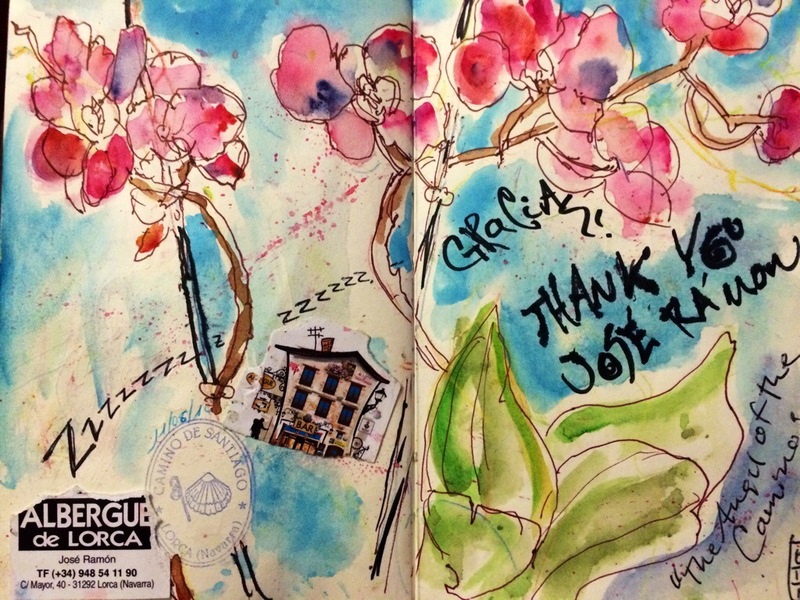 thank you for writing all of your poignant murmurs while on camino. my footsteps were a month or so before yours. I found while reading a smile for the beautiful Acacio & Orietta whom I felt I happened upon quite by design rather than accident. As a matter of fact, I stopped, decided not to wait til they were going to open, walked another .75 km or so and turned around and parked myself on a little bench on the side of their home just around the corner from the entrance until Acacio peeked his face around the corner and invited me inside. I cried and colored a mandala and felt grateful for me tears and their warmth. I could write several paragraphs relating to your writings – instead, I smile and thank you. Hi there, You haave done a ggreat job. I’ll definiitely digg it andd personally suggest tto my friends. I am confident they will be benefited from this webb site. Suzanne, I found your website and blog tonight. 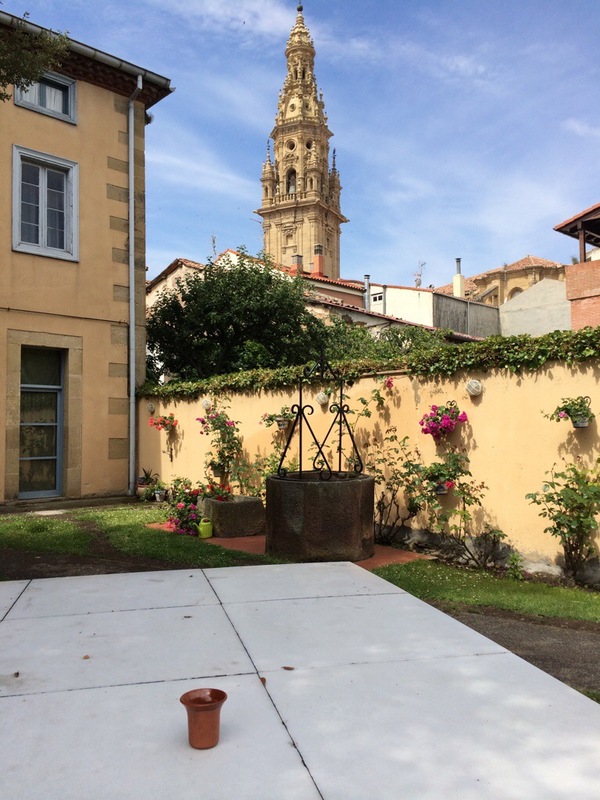 One of the first items that caught my eye was this blog of your Camino de Santiago walk. I have much more to read but, for now, let me say that I am completely entranced with your story. Your writing is exquisite; I can almost see, taste, and smell some of the experiences. What an amazing trip. I can’t wait to finish the story!